All images enlarge with a click; all blue text leads to a new page with a click. Click here for the “live” google map which will allow you to zoom in for extra detail. July 23 – we left Toronto Union Station at about 10 p.m.
Aug 09 – the Via train pulled in to Toronto’s Union Station at about 10:00 a.m.
To get a handle on possible routes, campsites, and portages we purchased Volume 3 of the Friends of Wabakimi (formerly Wabakimi Project) Canoe Route Maps series. We already had Volume 1 from the previous summer’s Wabakimi trip and had found those maps quite useful. While the maps I’ve included below will give you the general idea of the route, the $30. 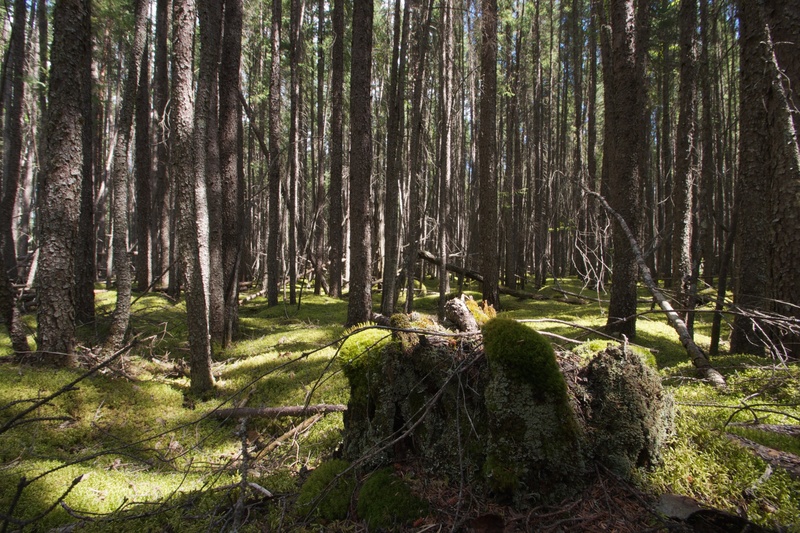 for the Wabakimi Project maps is an investment – and not a splurge! 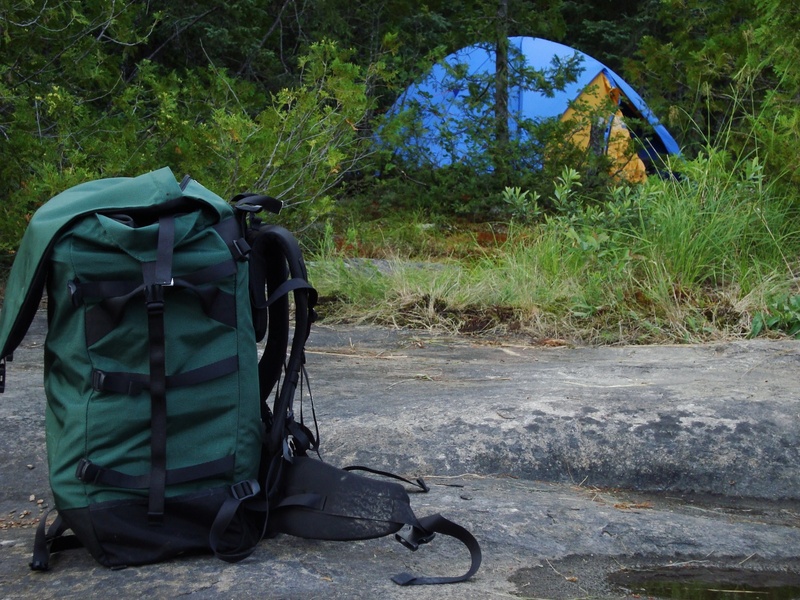 It will get you the campsite and portage information you need; it will also help this volunteer organization to pay for the cost of flying in people who give a week or two of their time in the summer to clear and mark the portages, create the campsites, and do the mapping work that makes the route maps possible. 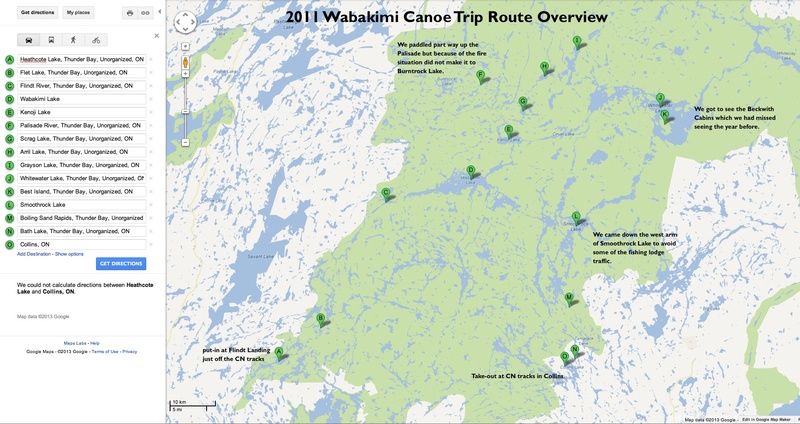 Do not set off only with the Wabakimi Project maps! The Federal Government 1:50000 topos will provide you with greater detail and more context of the route to go along with the Wabakimi Project maps. 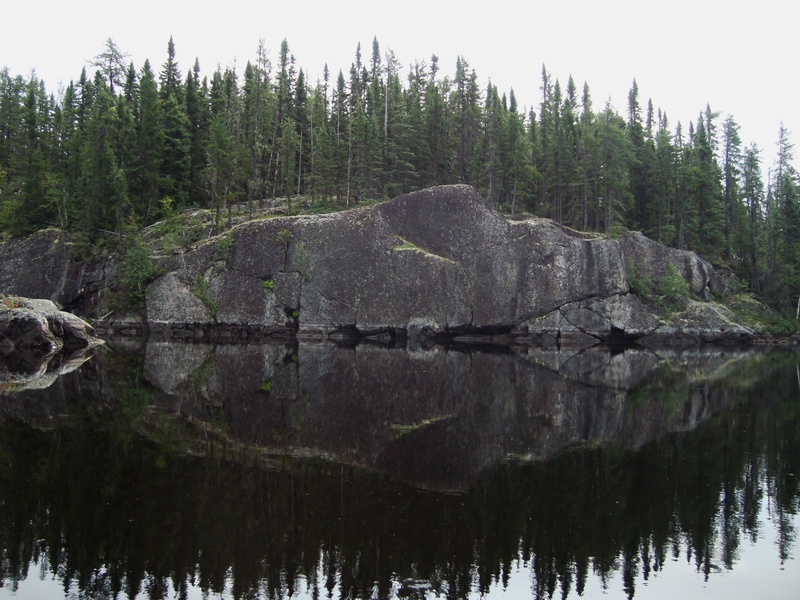 You can find the topos you need at the Federal Government’s Natural Resources Canada website and print them out yourself. Clicking here will take you to the 052 folder where you will find all of the following 1:50000 topos in either the J or the I sub-folders. Or just click on the titles below to access the files directly! The Google Earth app provides revealing views of the route and it is worth spending a bit of time getting the satellite perspective. A web version can now be accessed within the Chrome browser. Click here. As well, the Ontario Government’s Ministry of Natural Resources and Forests has its own online map service (see here) which provides more up-to-date and detailed maps than the Federal Government’s maps listed above. It is worth looking at them too – and even printing out certain sections. I also find their satellite imagery to be superior to that in Google Earth. Finally, we had a Garmin GPS unit (an Etrex) along for the ride as back-up and occasional solution to those head-scratching “where-the-heck-are-we?” moments! We also used it to record our daily track and features like potential campsites and outposts and rapids. If you want to see the SPOT Connect waypoints of our trip click here to download the 266k file. You’ll need the Google Earth application installed on your computer to open the file and see the GPS trail that the SPOT recorded. The first few kilometers from Flindt Landing down through Heathcote Lake are missing. We were still learning how to use the thing! I am really glad we brought it along. It provided the folks at home real-time info on our location and the email messaging option came in handy for sending brief okay or more personalized notes back home at the end of each day (45 characters max). It does this by pairing up with your smartphone (I use my iPod Touch). 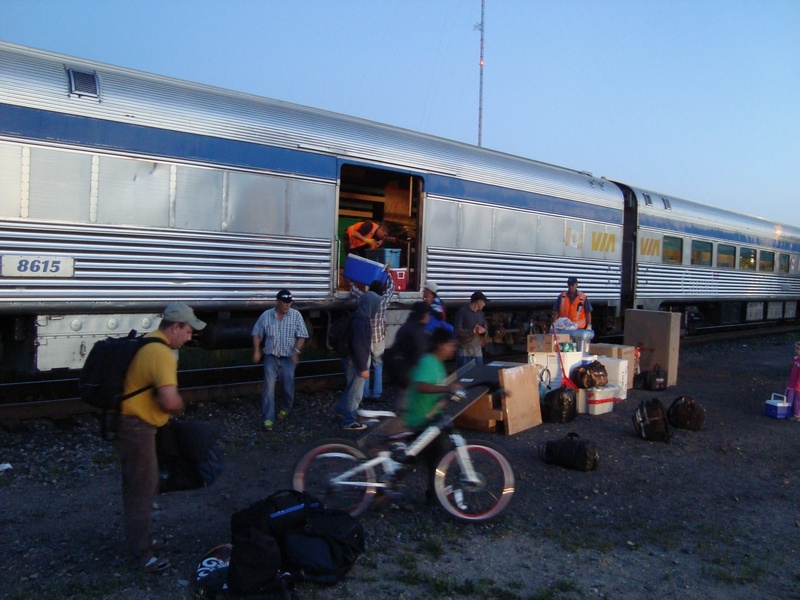 Stuff being uploaded from the baggage car at Armstrong Station- about two hours east of our exit at Flindt Landing. We got off the train at Flindt Landing around midnight. The lodge owner was up but was not expecting us. A confirmation call by me a day or two before would have been a good idea! Someone cleared the cabin on the island quickly and we had our home for the night. At $80. – or was that $100.? – it was a bit steep for the ten hours we’d be there. 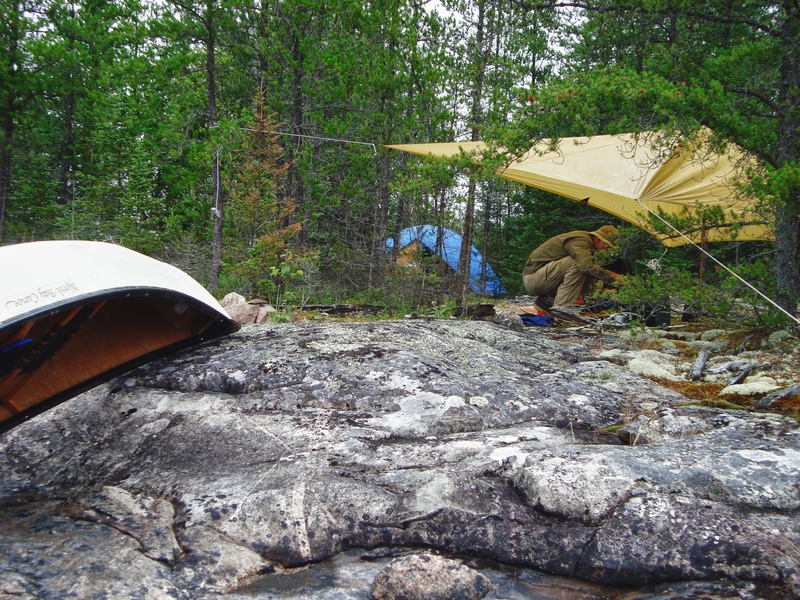 However, the alternative – looking for a place to pitch our tent at midnight either near the lodge or on the other side of the lake – was worse, especially since we had no information on actual camp spots that we could use. 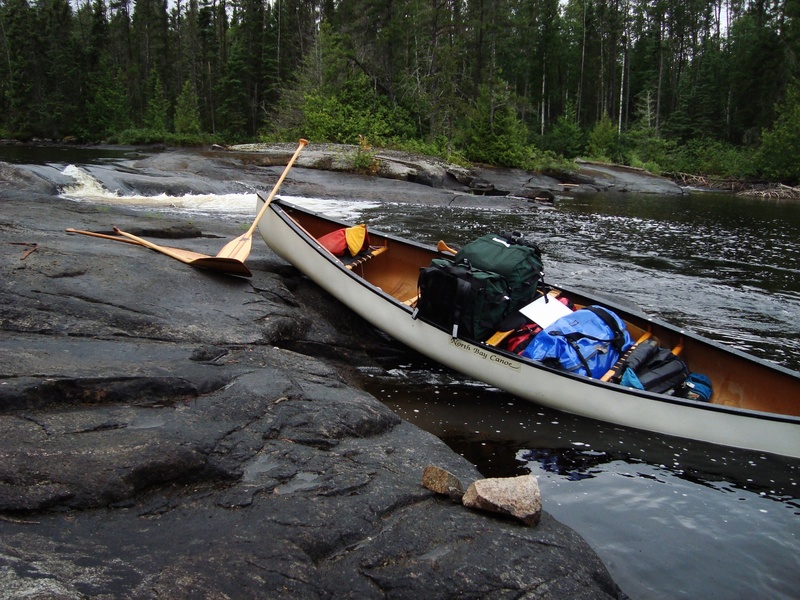 our canoe waits while we scout some rapids on the first day out. 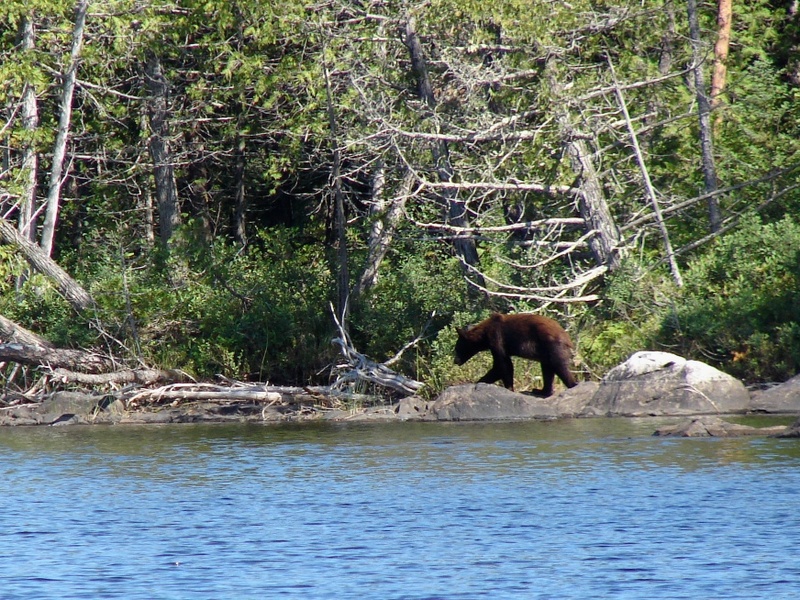 we got to share our portage trail with this local. We did a bit of this during the trip- here is Step one! The new L.L. Beans boots passed the test as we lined our canoe. It is great when there is somewhere to walk on the side of the river! Almost through – although I need to pay more attention to my rope! 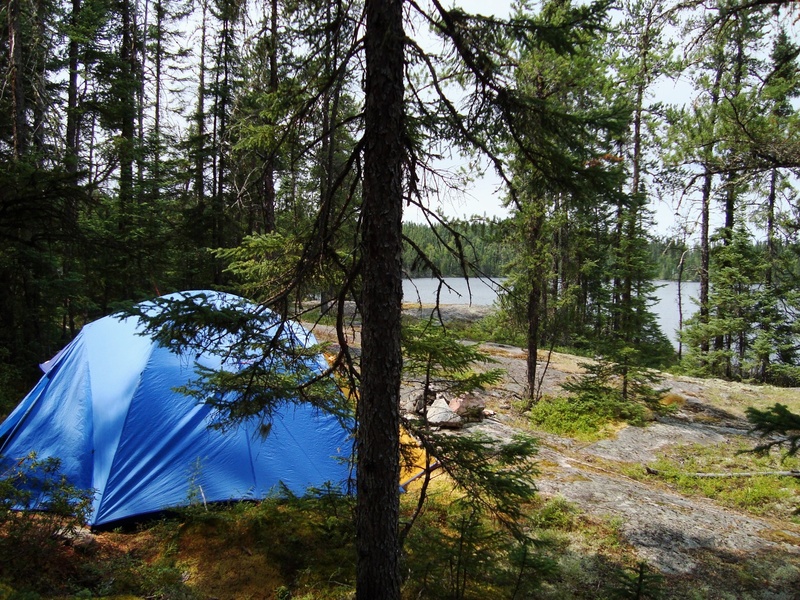 our Day Three campsite on the south side of Wabakimi Lake – see map above for exact location! 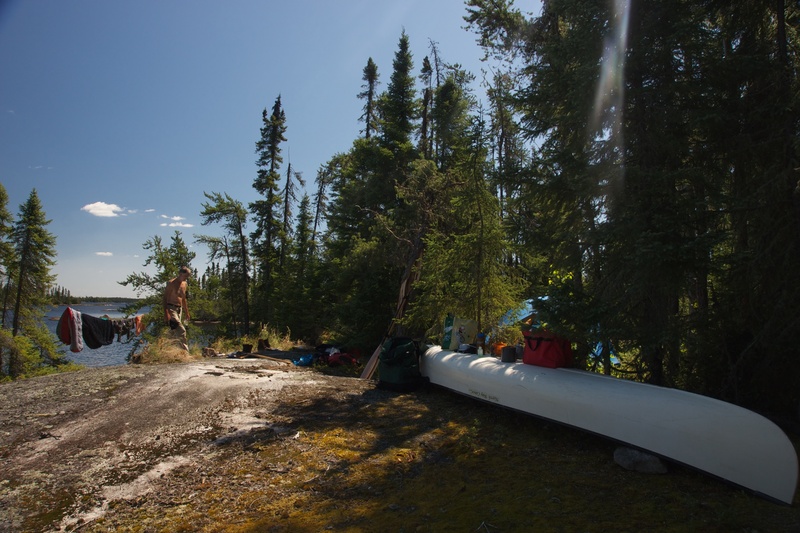 break time on the north shore of Wabakimi lake as we paddled through the maze of islands, using them as windscreens! 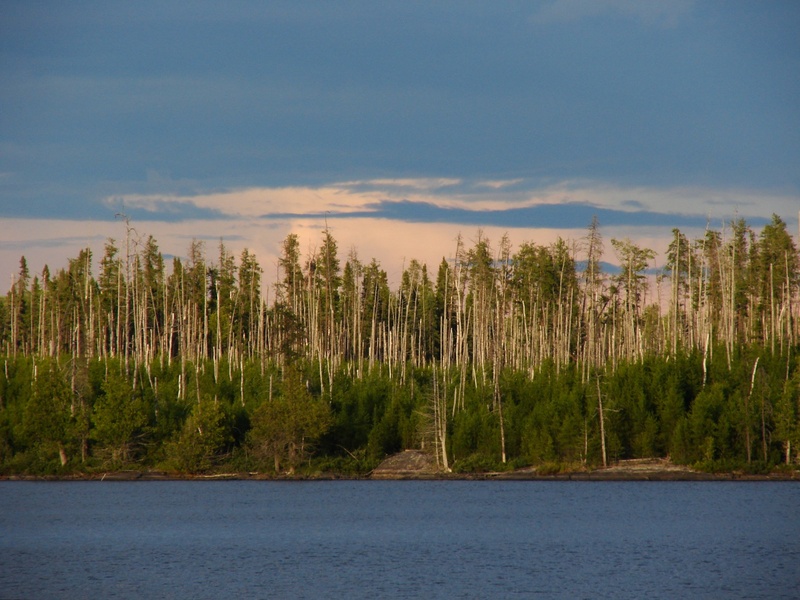 a fishing lodge at the east end of Wabakimi Lake just as you enter Ogoki River Bay- nobody home! It is almost 9 p.m. as we gaze westward towards the soon-to-be setting sun. 9:35 a.m. and the boys are having a Clif Bar and some Gatorade while sitting on a rock on the side of the Ogoki River. The first view of big smoke! We had just put up our tent on the SW corner of Arril Lake. Returning to the shore for the rest of our gear, we saw what you see. 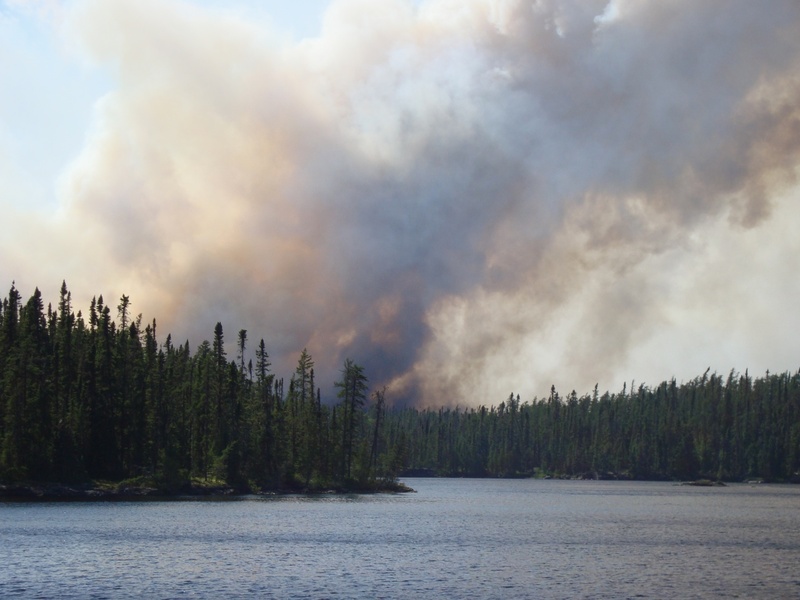 See the section titled Smoke Over Wabakimi for all the details! For the next five hours we would paddle like crazy to put some distance between us and what you see in the picture. the end of day on our sheltered island campsite- time to look for Group of Seven photo ops! 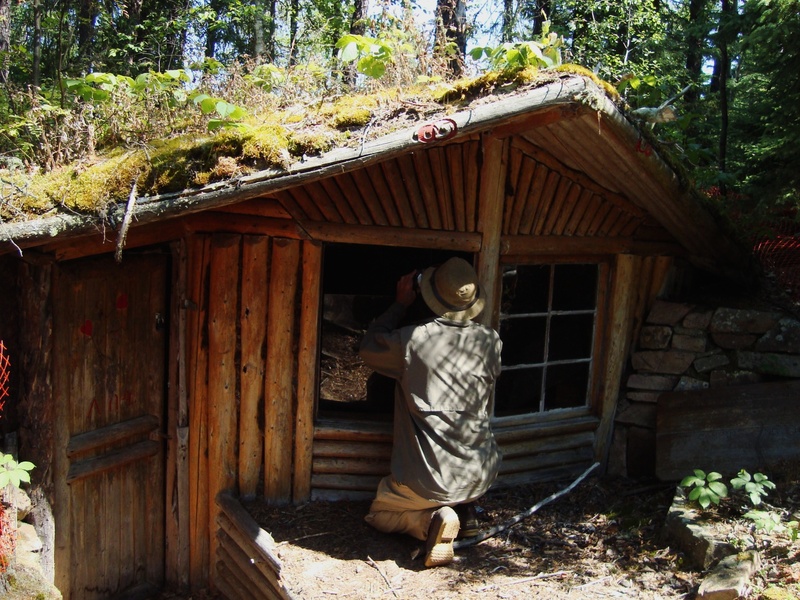 looking into one of the Wendell Beckwith cabins during our visit to Best Island…see the section titled Ogoki Lodge and the Beckwith Cabins for more photos. 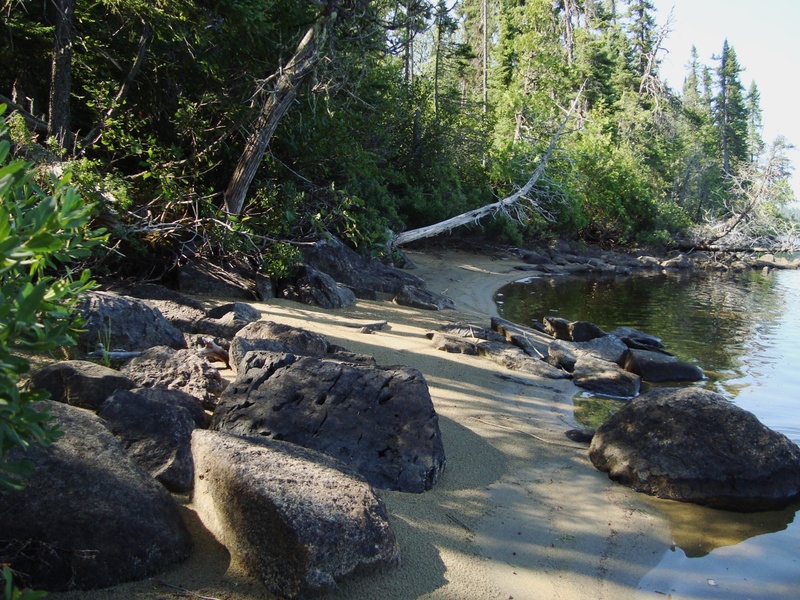 A trail leads from this sandy beach to the Beckwith cabins. Apparently, Beckwith himself died on this beach in 1980. Near the beach is a fairly large flat area where groups of paddlers have tented. We decided to camp at the south end of the island instead. The Caribbean-like sand beach goes on for a couple of kilometers on the south end of Best island. (Good luck with the sand flies if you decide to tent there!) 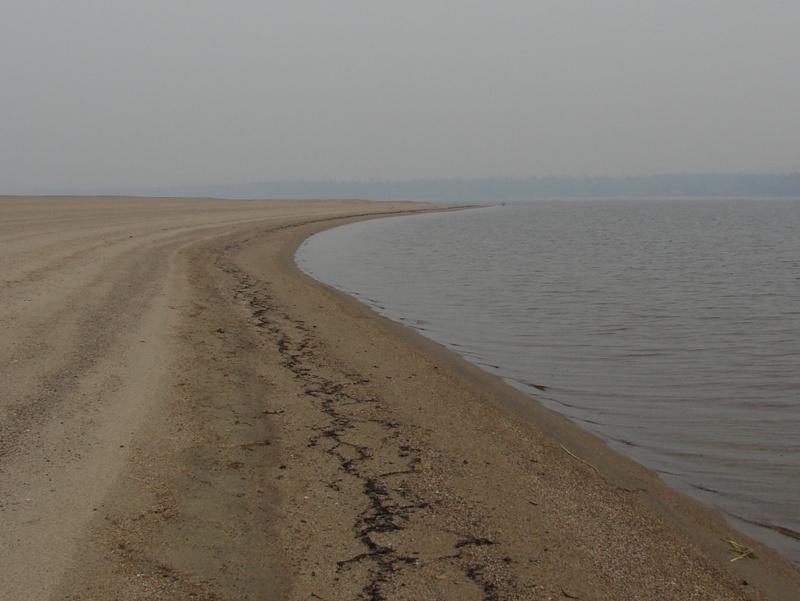 BTW it is a bit hazy because of a second fire – Thunder Bay 57 – just west of our campsite. 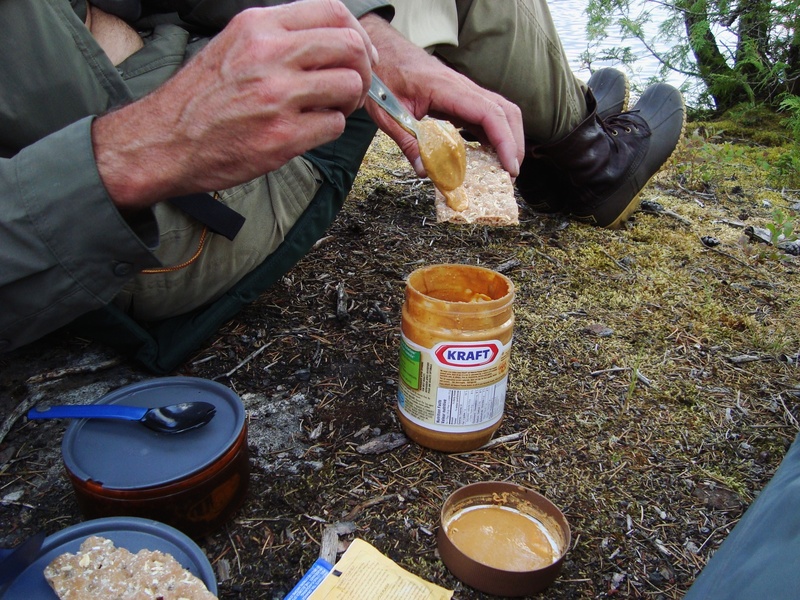 a late breakfast on a flat rock in the middle of McKinley Lake- we had left Best Island by 5:45 without having breakfast because of the sand flies – and also because we wanted to get past our new fire concern – the fire to the west of Whitewater Lake! 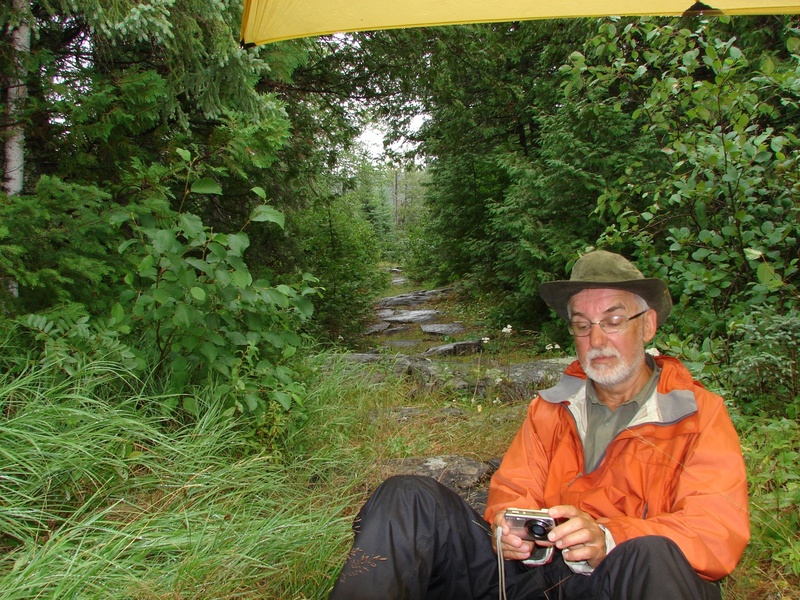 me getting instant feedback on a shot I’ve taken while sitting under the tarp at the end of the portage – this was the first canoe trip where we were happy every time it started raining! This is what I was looking at in the above shot! I wasn’t sure if the raindrops would be sharp enough. the breakfast table on the beach- notice the coffee filters for the real coffee we brought along for the first time. From now on, no more instant coffee! we sit out an afternoon shower at our campsite on the west arm of Smoothrock Lake. For a while, the sky got very grey. 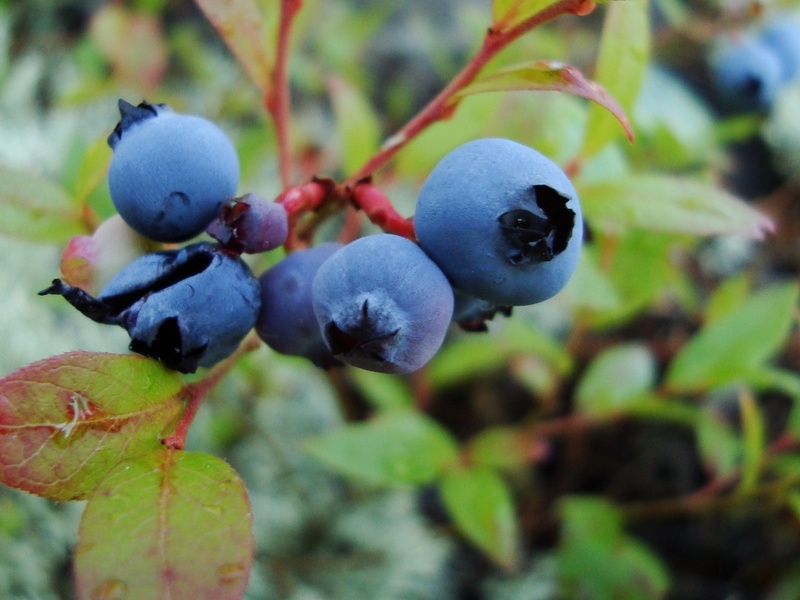 With blueberries all around and lots of time to kill, we start picking- and eating. lunch break on the Boiling Sand River- we had three days to do about twenty kilometers! Easy does it! our last three days were spent covering about 20 kilometres- we wanted to make sure we didn’t miss the Monday morning train! We’re suckers for shoreline reflections. 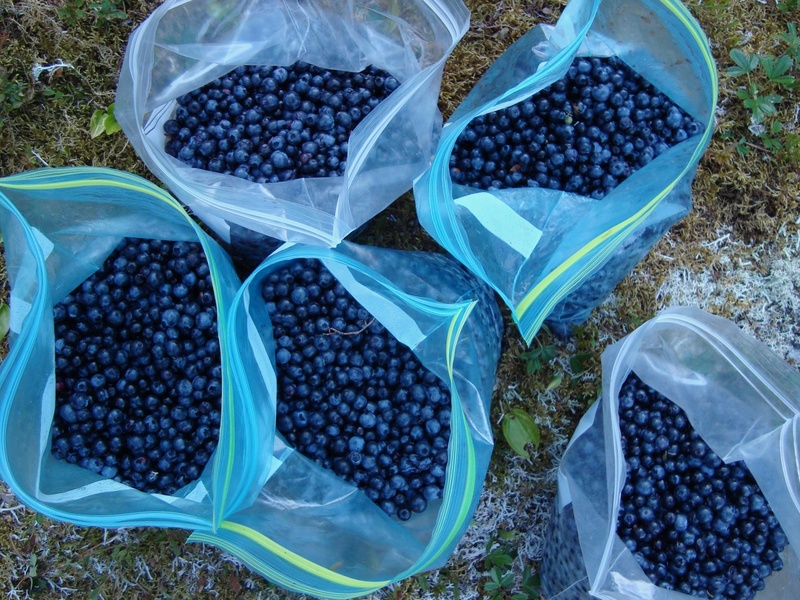 the bit of food we had left was up in the tree and down in the bay were the eight quarts of blueberries. We wanted to keep them cool- we just managed to get them wet! same sunset a few minutes later! 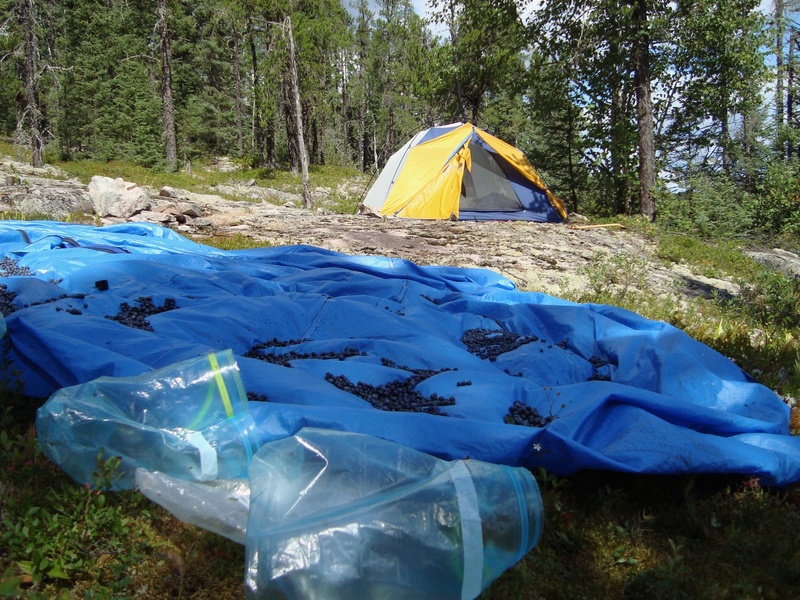 failed attempt at drying out 15 liters of blueberries- we would later dump them all into Bath Lake! It was a painful experience! 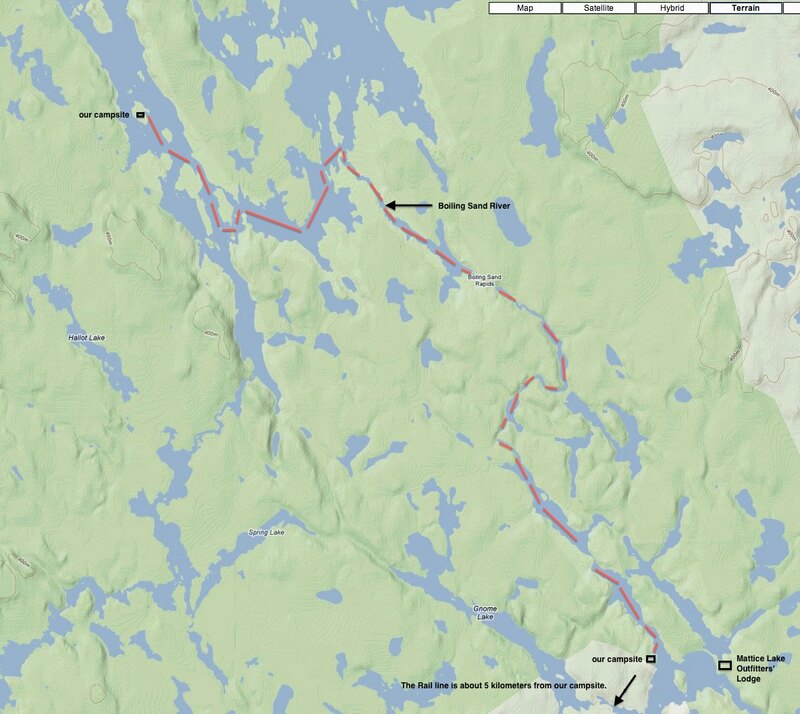 the rail line runs past Bath Lake from Collins- we would portage over it the next morning. We should have just arranged to meet the train at the portage point instead of paddling to Collins! 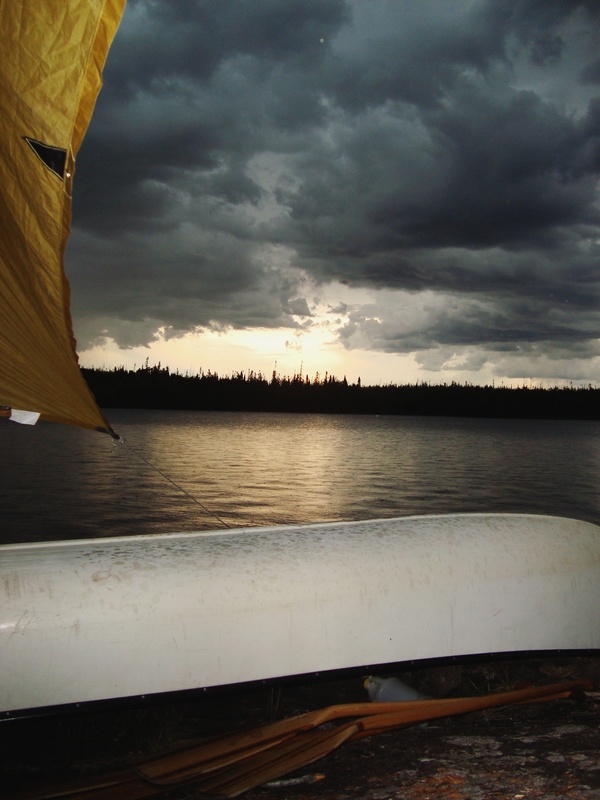 Check out the other two parts of our account of our 2011 Wabakimi Paddle. 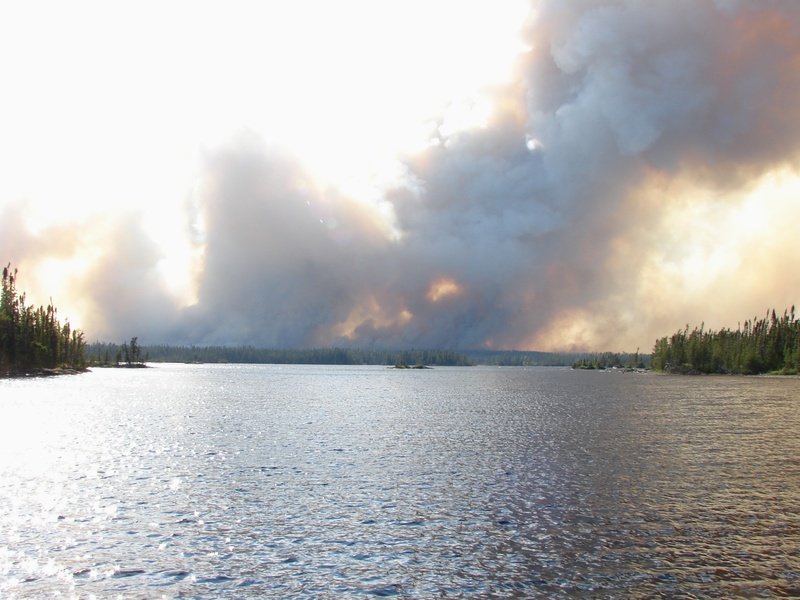 There is one post that focuses on the fires we paddled into- and another post that looks at (mostly) the Beckwith Cabins on Best Island and the Ogoki Lodge just to the south of Grage Island on Whitewater Lake. 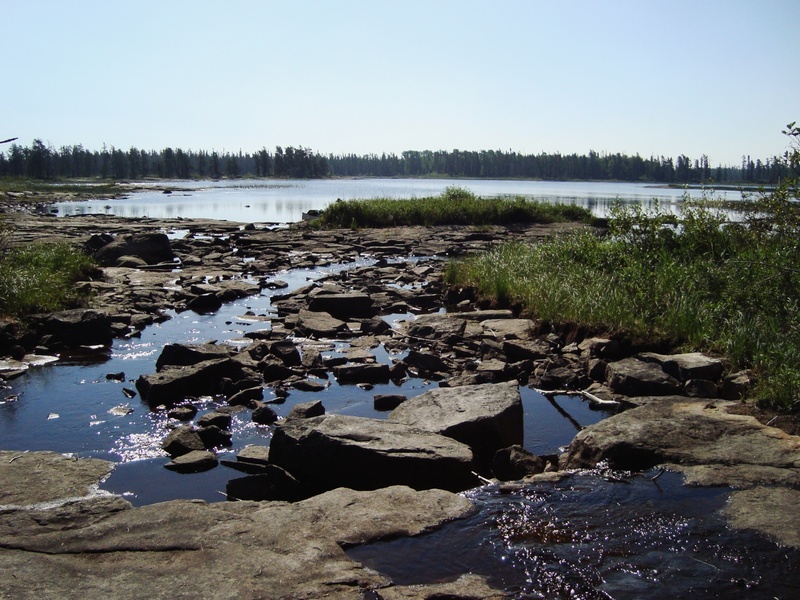 It’s always nice to read up on other folks experiences paddling through the waters of Wabakimi P.P. 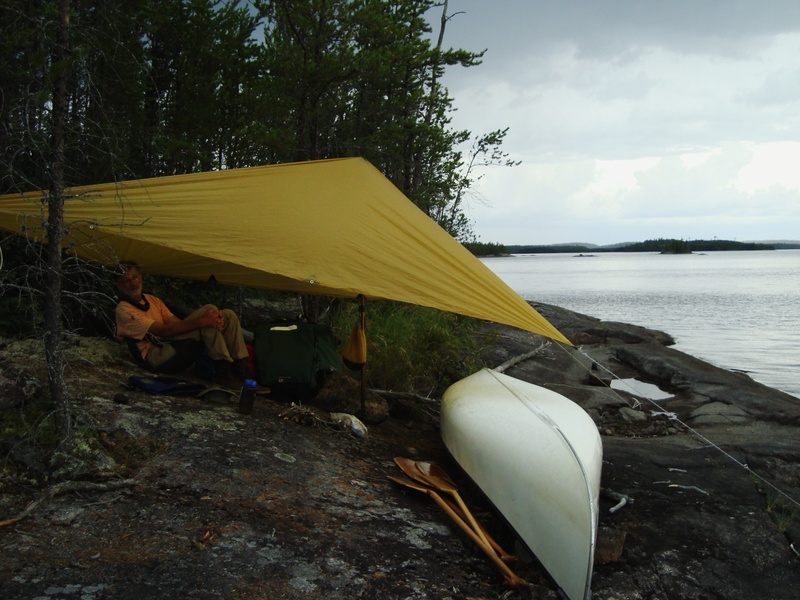 You can read our blog here:http://www.songofthepaddle.co.uk/forum/showthread.php?32424-Journey-to-the-Centre-of-the-Universe-%E2%80%93-Wabakimi-Ontario-2010&highlight=wabakimi , if you’d like to? Fred and Kelly, it is a bit late but…thanks for looking at the post! From the date I think I was on the trails of Patagonia at the time and somehow never got around to acknowledging your comment. 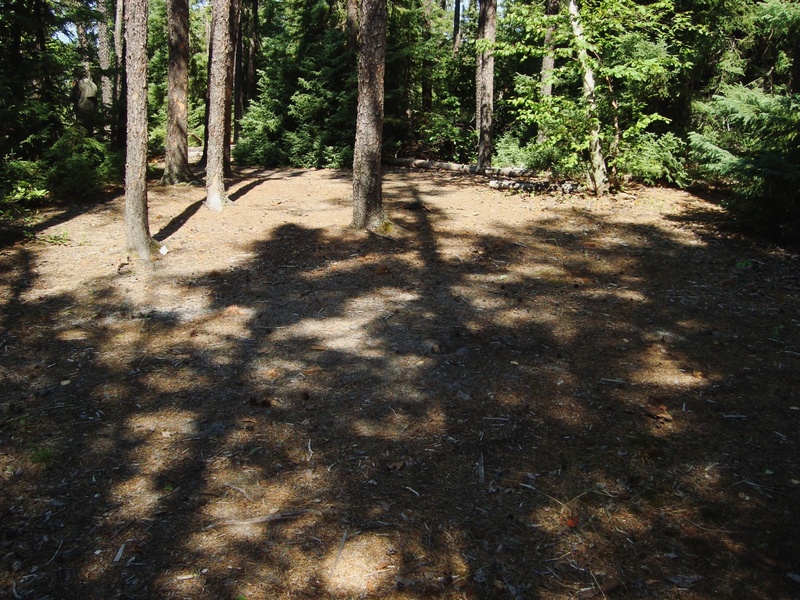 BTW – I really enjoyed reading through your post on your trip to Whitewater and loved the way you made use of the topos in your write-up. Lucky dog! I also remember seeing your title and thinking that my attempt at coming up with something eye-catching was maybe not so original after all! I do hope your list of adventures has grown longer and that maybe northern Ontario is in your sights for another visit. 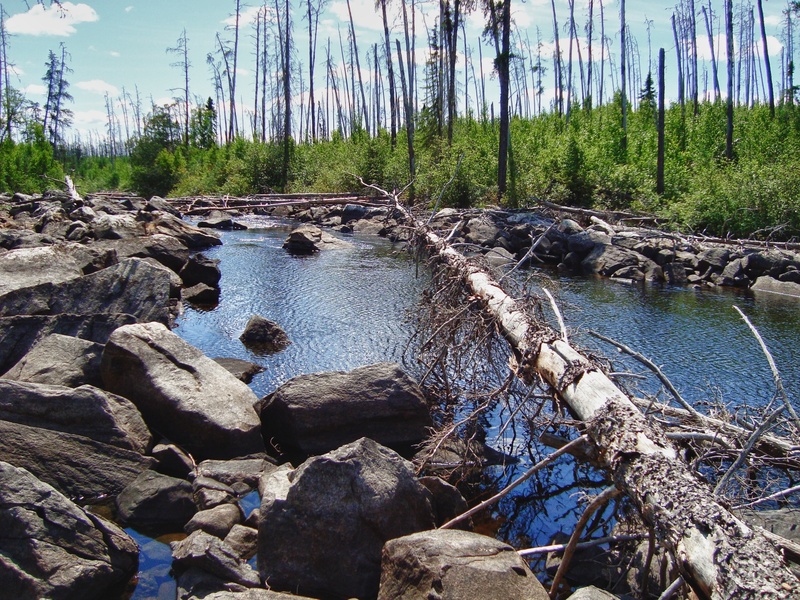 Wabakimi has yet more to offer and the Bloodvein River system is a spectacular journey. 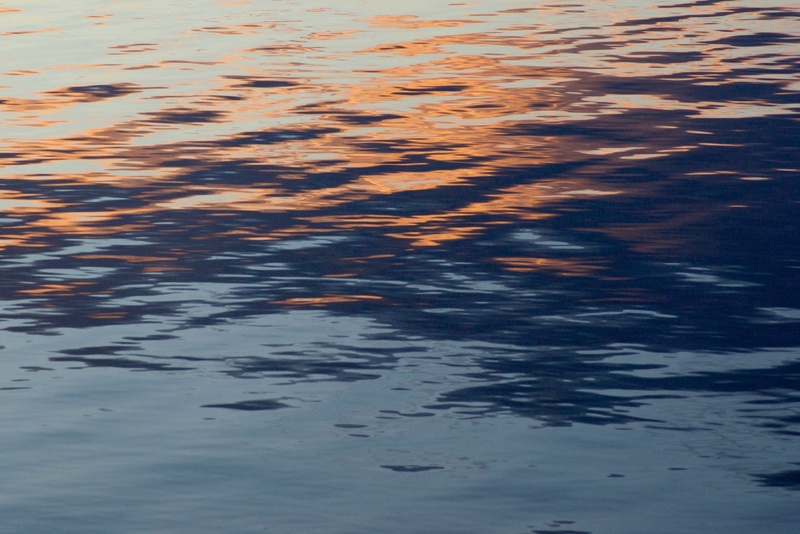 Your paddling adventures are always a treat to read and follow. I read your Bloodvein and Wabikimi trip reports, and used the Wabikimi notes for some of my Wabikimi trip last summer. 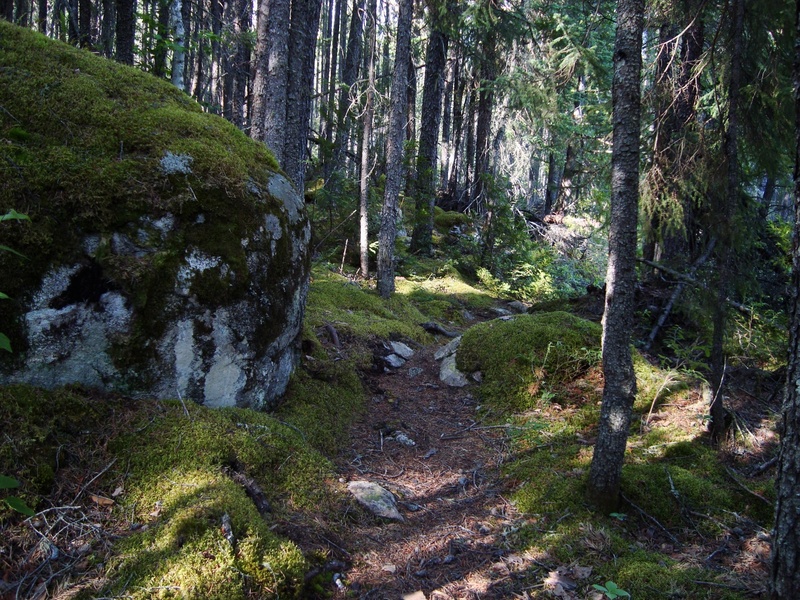 Covered part of a route that you previously made: down the Allanwater to Wabikimi. 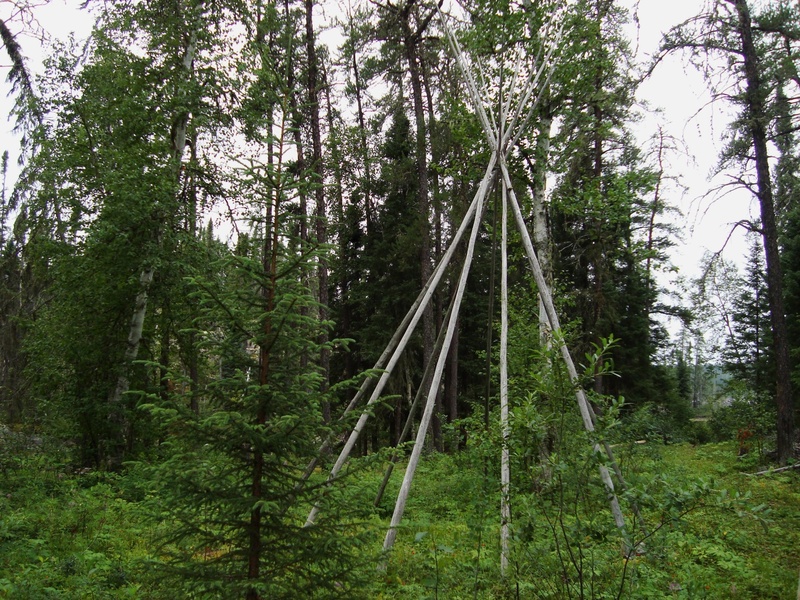 From there, however, I went through to Lower Wabikimi to Smoothwater Lake, then Caribou and Little Caribou and out. I used some of your description and notes along the way. 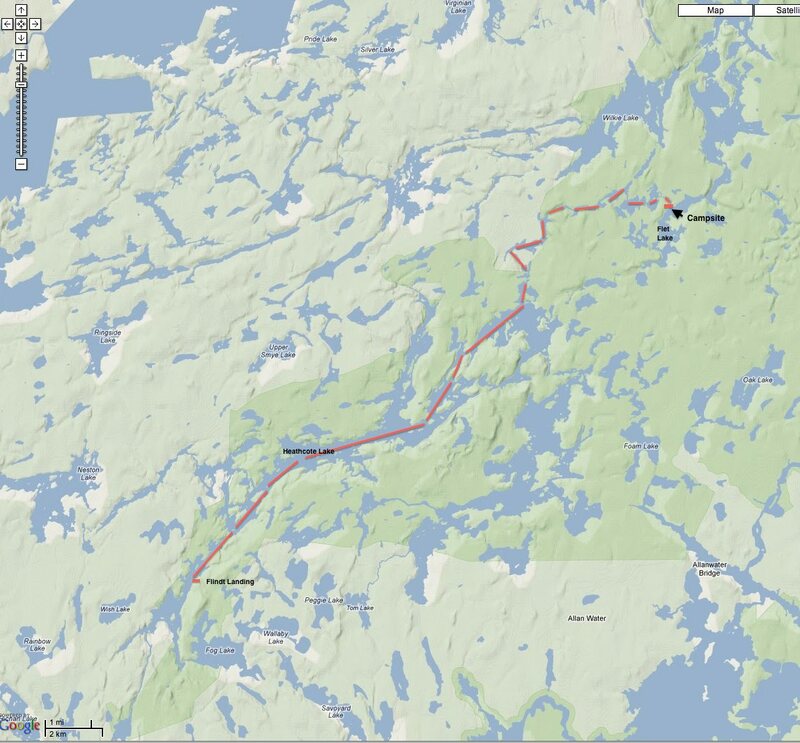 I plan to return to Wabikimi next year and take a different route, but end up at Bath Lake (or Collins Lake) to catch the eastbound VIA. 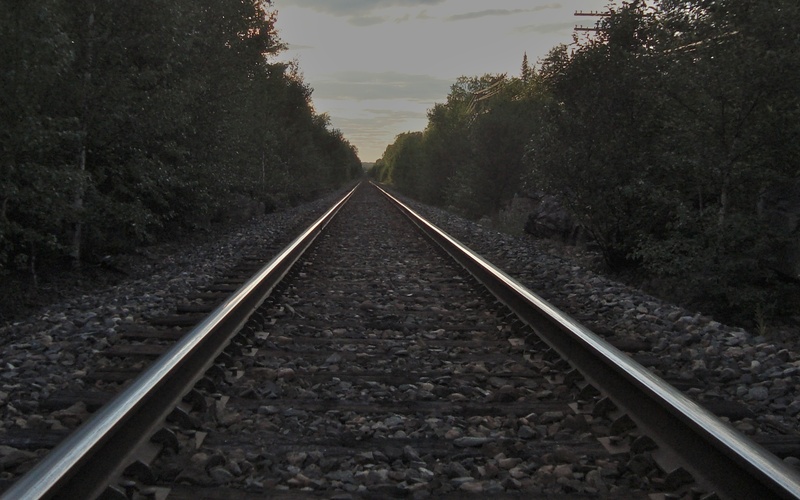 Did you catch the VIA train at the town of Collins, or at the bottom of Bath Lake? 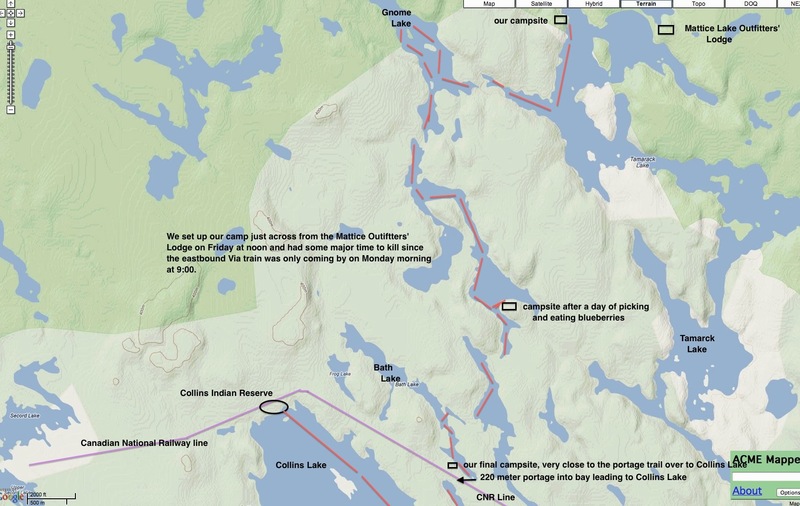 My map (topographic 52 I/6) shows that Collins isn’t on the water. What would you recommend for the takeout? Dan, it’s nice to hear that the canoe trip reports are useful. Re; Bath Lake versus Collins as a VIA extraction point. We ended up paddling to the Collins VIA stop because we couldn’t find out the mileage # for the Bath Lake stop. Dumb! 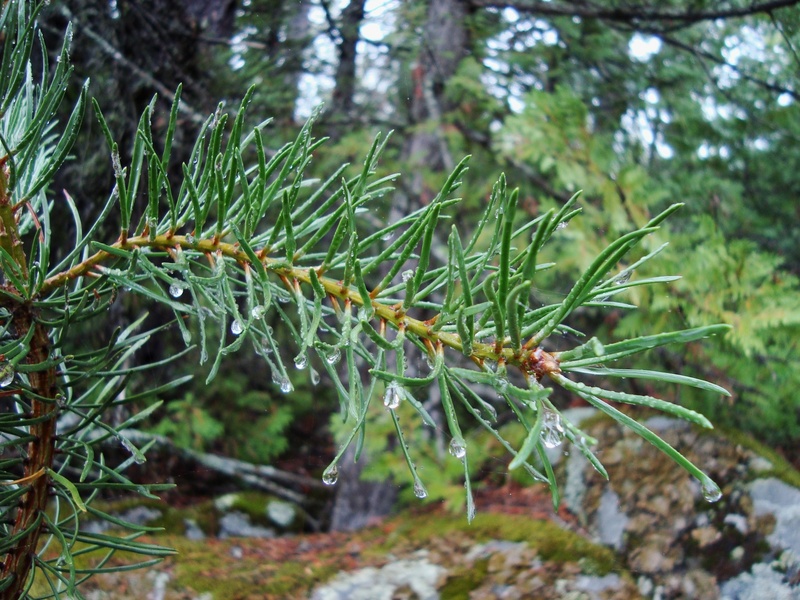 Here is a link to the Wabakimi Project’s page on VIA access. The Bath Lake mileage marker is 19.3. At the time I didn’t know where to look and the helpful VIA person didn’t have a clue either. He suggested I measure the distance from Vancouver myself! Since Collins is a known stop, I figured we would be best to go with that. 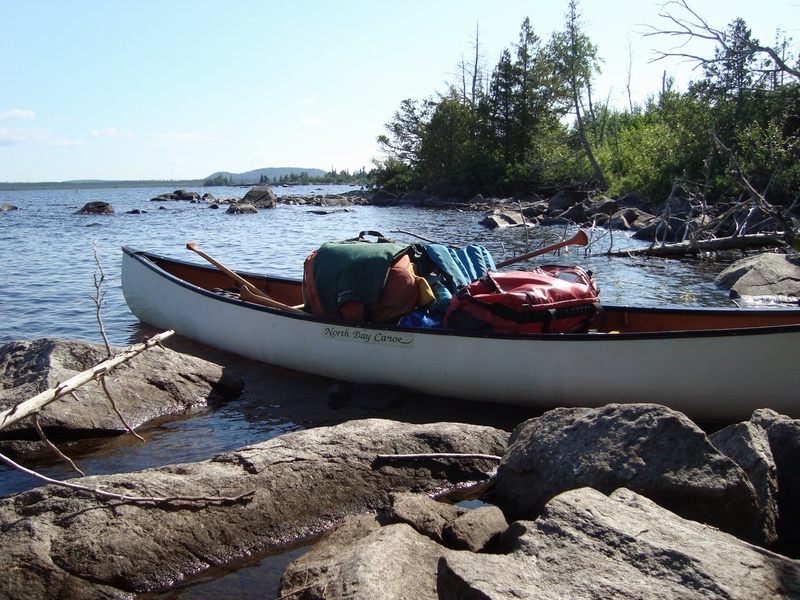 It did require an extra portage and a 30 minute paddle to Collins VIA stop (and unofficial Native reserve). Spare yourself the extra work and get picked up at Bath Lake, having requested the stop when you buy the tickets a couple of weeks before. 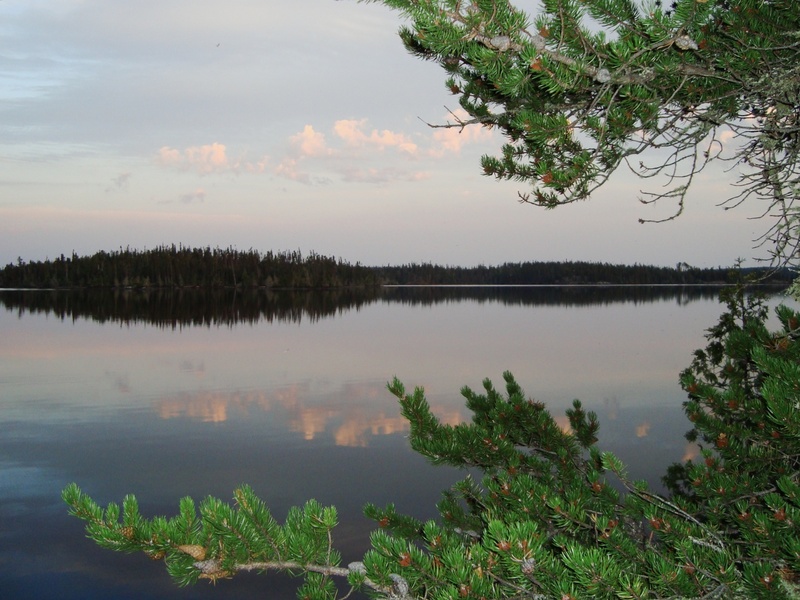 My bro and I are mulling a return to Wabakimi next summer. 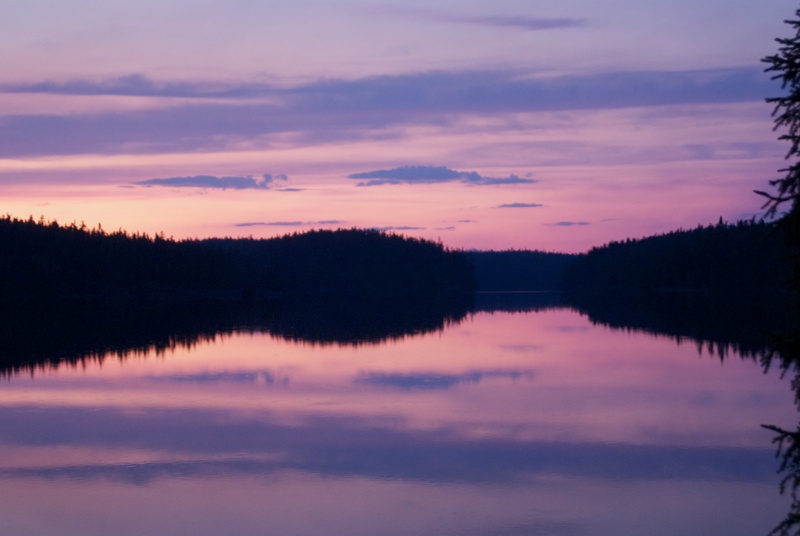 We like the isolation and the relative quiet of the place – the few fishing boats on certain lakes excepted! 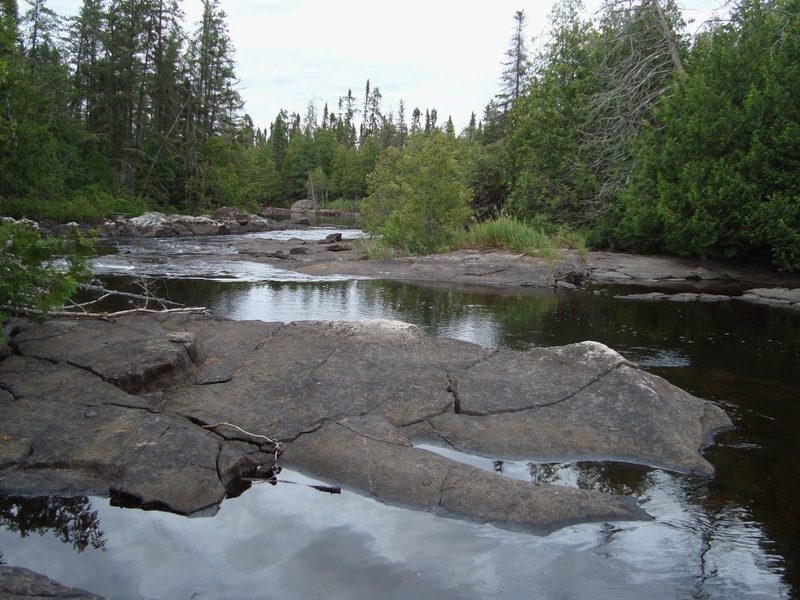 The Coulonge River and its LaVerendrye headwaters is another possibility but it doesn’t offer what Wabakimi does. Maybe we’ll see each other next summer! 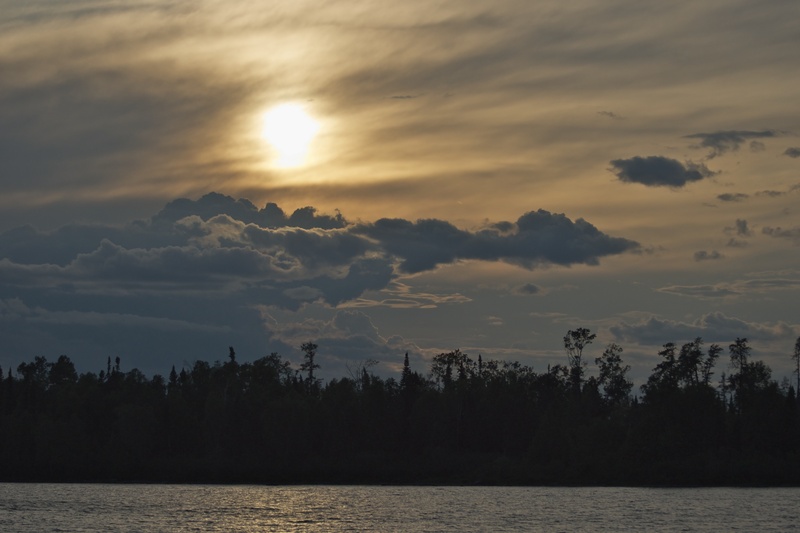 Going to make my Wabikimi trip in a few days starting at Flindt Landing and then going up the Flindt River system to Wabikimi Lake, River Bay, the Ogoki River to Berg River and down to Smoothwater Lake, where I’ll do a lot of canoeing on both the east and west arms. 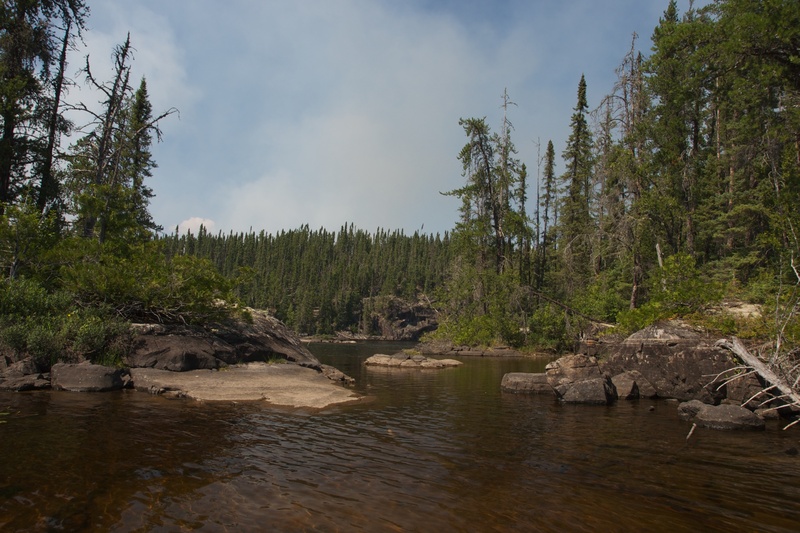 I’ll come out at Bath Lake/Collins via the Boiling Sand River and assorted lakes. As usual, I’ll be using your notes on the sections that duplicate the trip you have already taken. Dan, have a great trip. Nice to hear our exhaustive trip descriptions are being used! When we did it we paddled right to Collins since it is a designated stop on the VIA line. Had we had the mileage marker for Bath Lake we would have just got on the train there instead of spending the extra hour or two to paddle up Collins Lake to the Collins VIA stop. 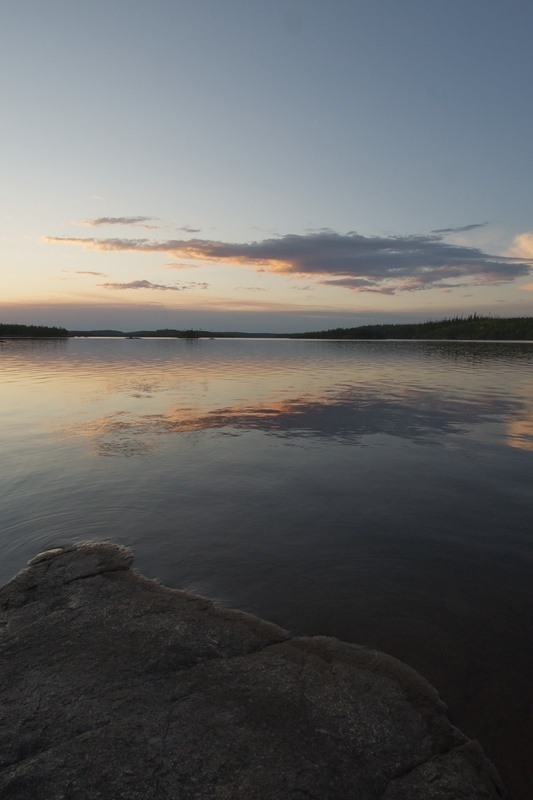 We hope to get back to Wabakimi next summer. 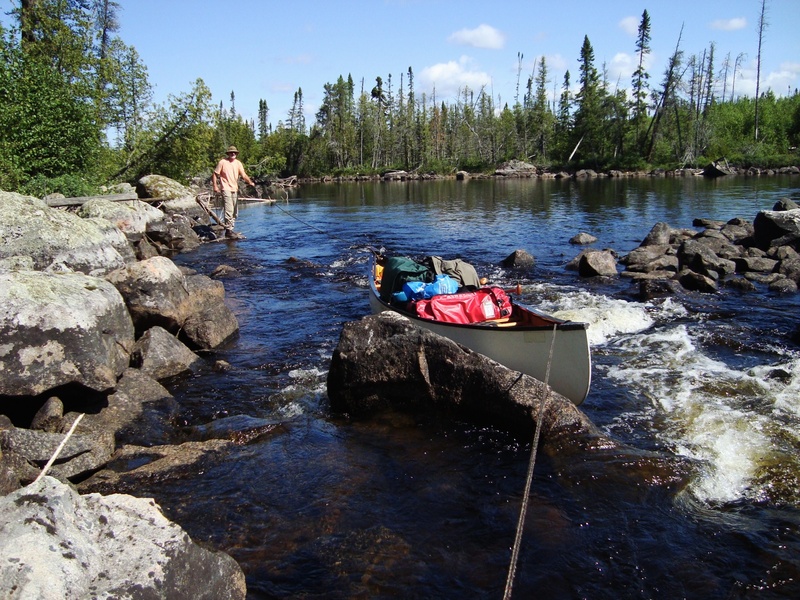 This August our big trip is down the Coulonge River system. 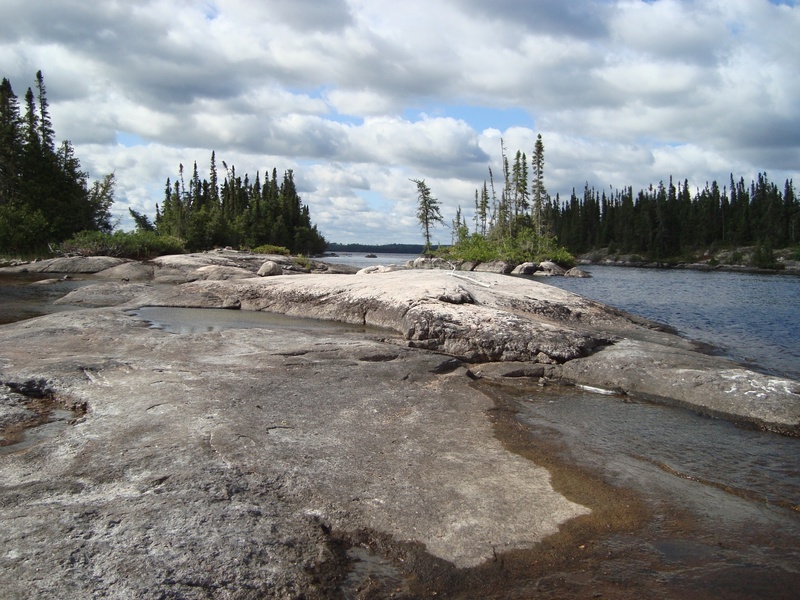 It is a 260 km run with lots of swifts and runnable rapids but it certainly would not have the isolation or wilderness feel that makes Wabakimi special. 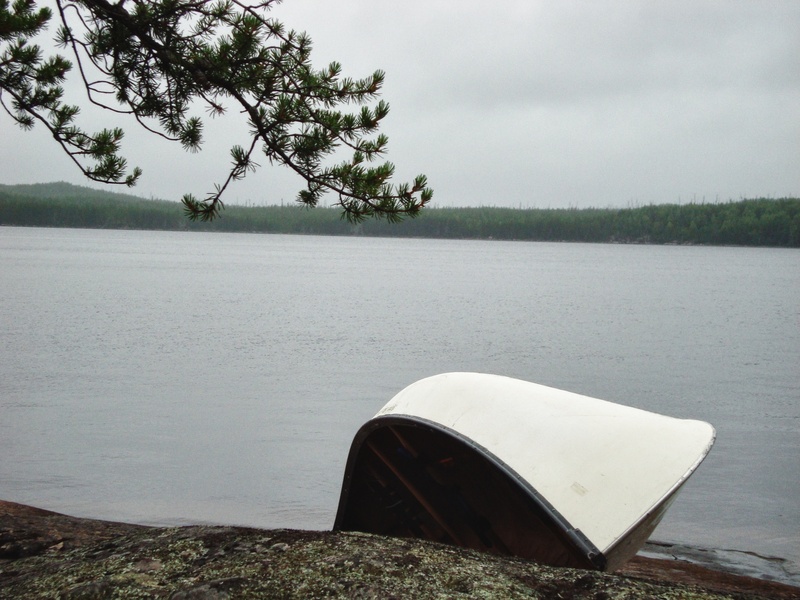 Enjoy this summer’s canoe tripping! We’ll compare notes in the fall. You’ll need to post an up-to-date trip report; ours is already five years old! 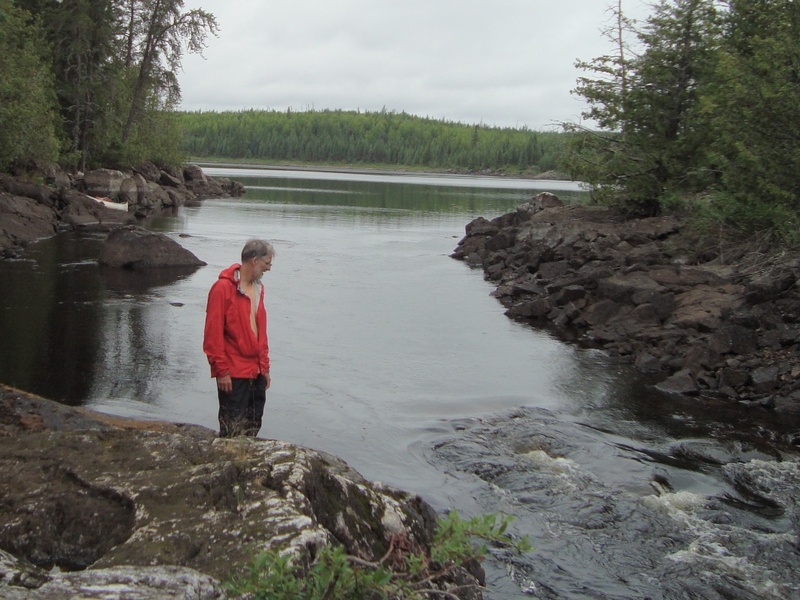 Well, I made the Wabakimi trip again this year, following your notes for the Flindt River starting point. They are/were very helpful. 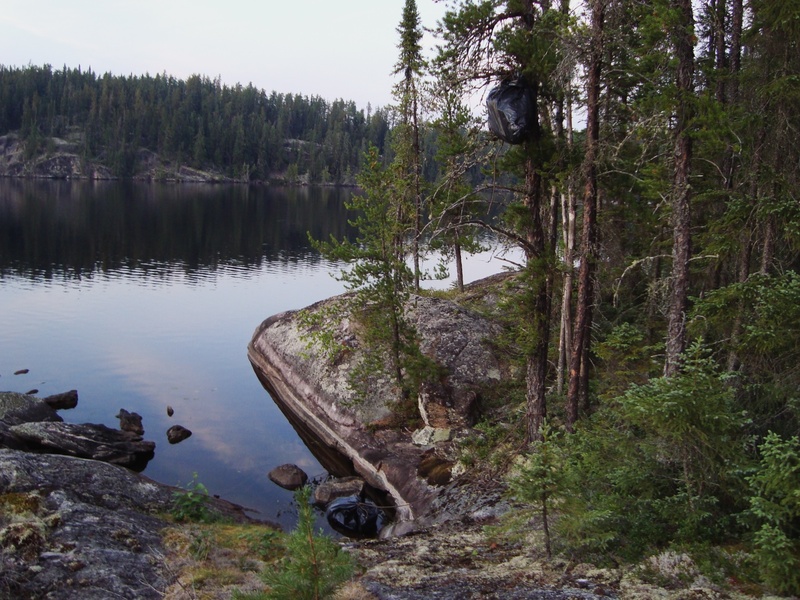 The trip from Flindt Landing to Wabakimi Lake went smoothly, but the campsites that I used on the Flindt River system and Tew Lake weren’ t marked on my maps (Wabakimi Project maps), while some that were marked on the maps weren’t there. I quickly learned that the best thing to do is have a destination area and campsite in mind, but if towards the end of the day you come across something, take it, because you never know what you will find. I did stay at the site where you camped at the north end of Smoothwater Lake, easily the most scenic and spectacular of the trip. 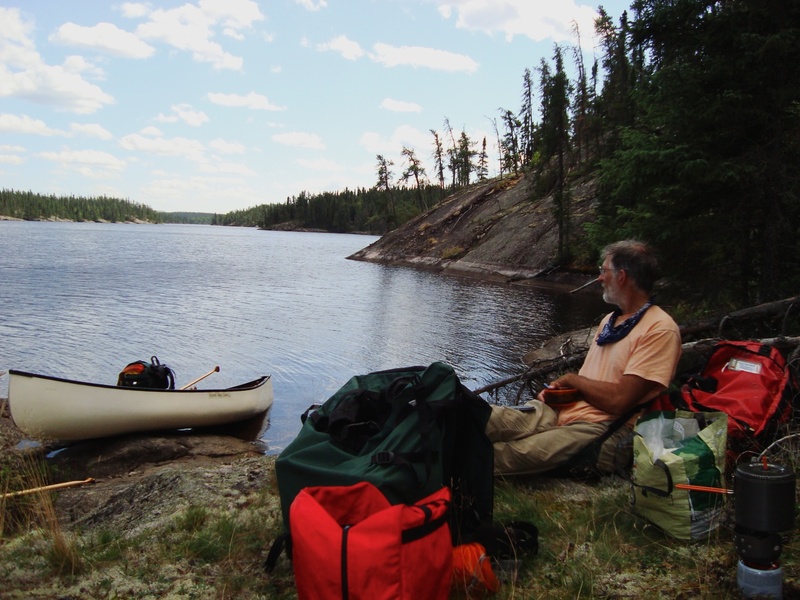 Coming out of Tew Lake, I dreaded the paddle down Wabakimi Lake to River Bay, but fortunately the winds were calm and the paddle, while long (and longer) was uneventful. 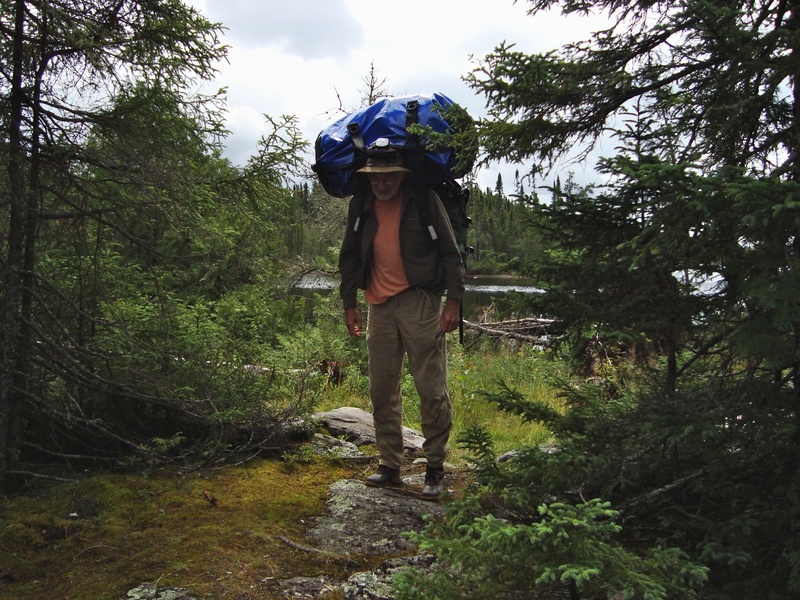 When coming out of the park at Bath Lake I decided that I would go all the way to Collins, as I was afraid that the train would go zipping by if I waited at the Bath Lake portage. 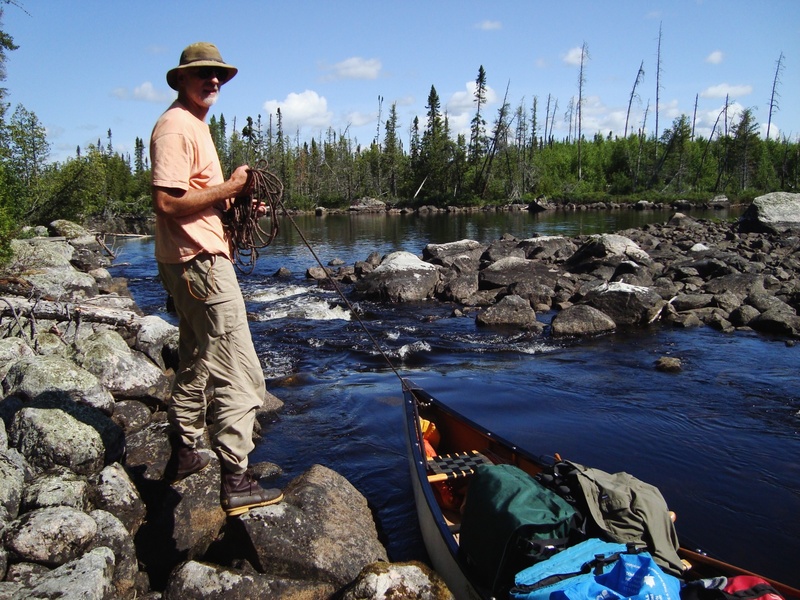 As I had rented a satellite phone, I could have called in for a stop, but….While in Collins, I met Laurie Mills, who makes canoeing maps of the area. He and his friend knew you (or about you) when I mentioned your trip notes. 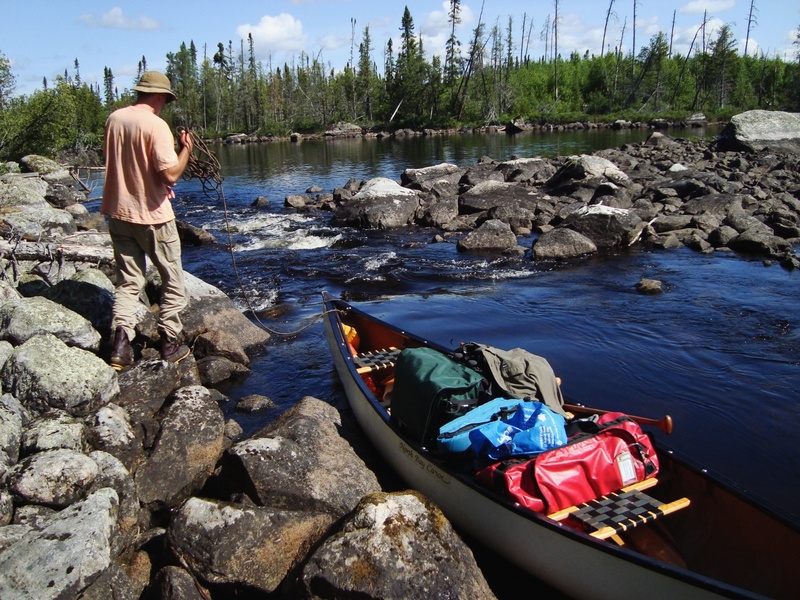 He outlined several trips that he recommended for Wabakimi paddlers, including the Kopka River. 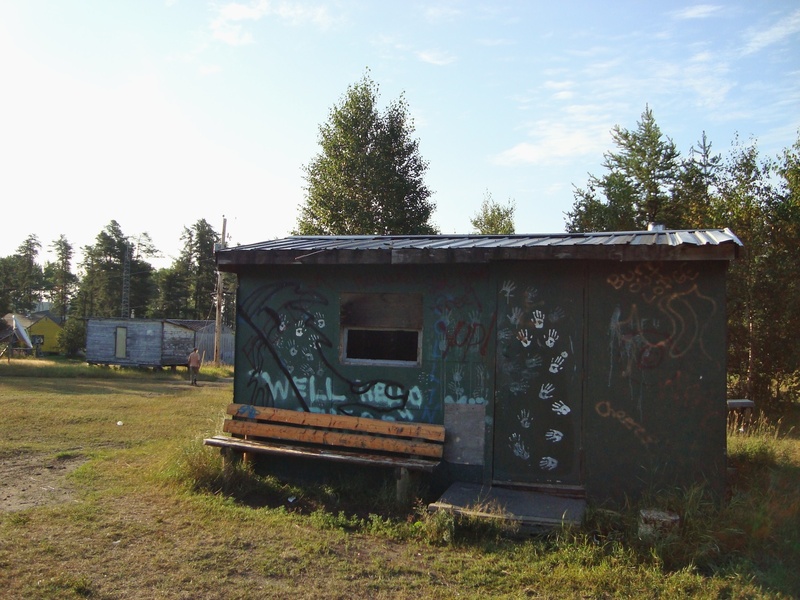 I should mention that the First Nations band at Collins was very accommodating, allowing me to use one of the cabins at the reservation until the train the next day. I am planning a trip next year, and I’m considering the Kopka River, based on Laurie Mill’s suggestion. I would use your notes and excellent description. I have one question. It concerns day six, where it said you covered 47 kilometers. Is this a misprint or did you have strong winds at your back that day? 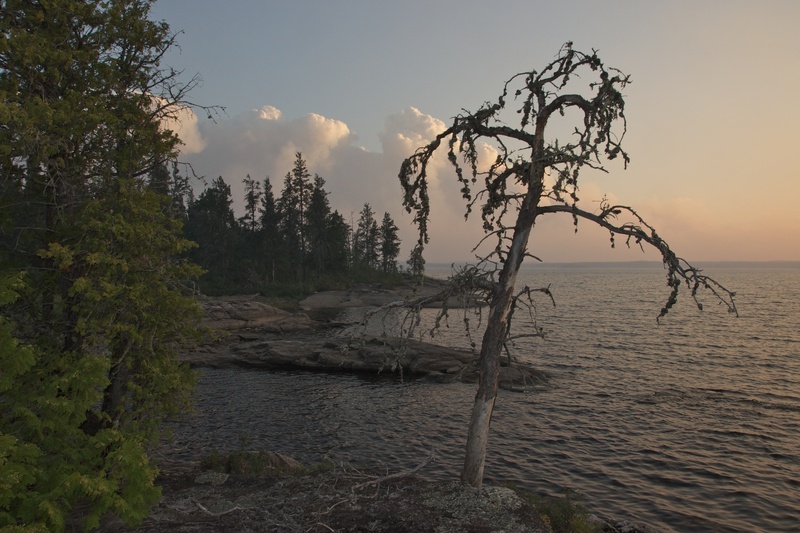 All the pictures that you included in the report make this a trip to dream about over the cold winter months, so hopefully the summer will bring more Wabakimi. Again, your reports are a delight to read and an indispensable part of my times in the park. Keep up the good work . Dan, good to hear from you. Here it is harvest time and you are already planting seeds for next summer’s adventure! Your fear of missing the train was exactly how we rationalized the extra bit of paddling from Bath Lake! Your getting to use the cabin at Collins was definitely handy. We did notice a couple of cabins (or 3?) on the lake shore as we came up the Collins beach. Laurence Mills was my source for the Kopka trip back in 2012. I also contacted him for our 2013 ramble around the perimeter of Wabakimi and sent him some info on stretches he had no info on. BTW if you want his Kopka maps I would be happy to give them to you. Re: the 47-kilometer day. Pretty crazy, eh! Thanks to the weather – rain and wind – we had just had two way below average mileage days and the pressure was on to make up for lost time. 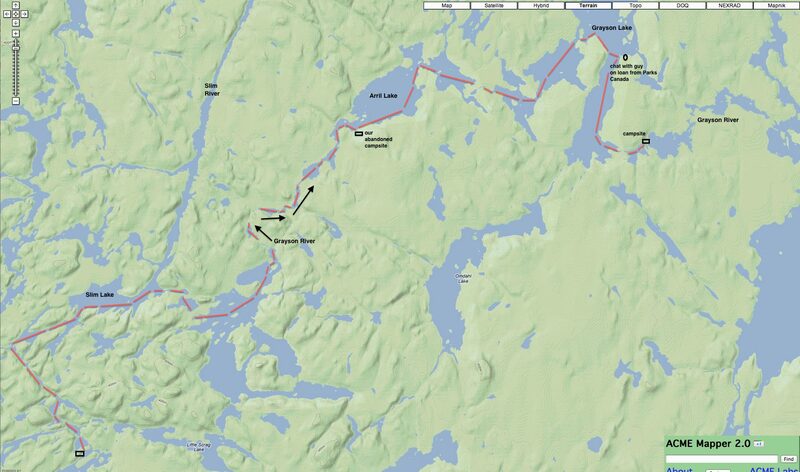 So we did indeed move 47 kilometers through one lake after another that day, probably a twelve-hour day. No rapids, no portages, and a helpful wind also factored in. There is no need for you to repeat this! Thanks for the offer on the maps. As I haven’t yet decided (still dreaming) on next years trip, I will wait until later to see if I will take you up on the kind offer. I’ve also got three or four choices floating around in my head. It’s funny how one always bubbles to the top! In the meanwhile, keep on dreamin’! I found this query in my series of posts on Quebec’s Coulonge River – Day 11 = and while I answered it there, I also pasted my answer below since it has to do with a Flindt River / Little Caribou Lake route that Jeff was wondering about. 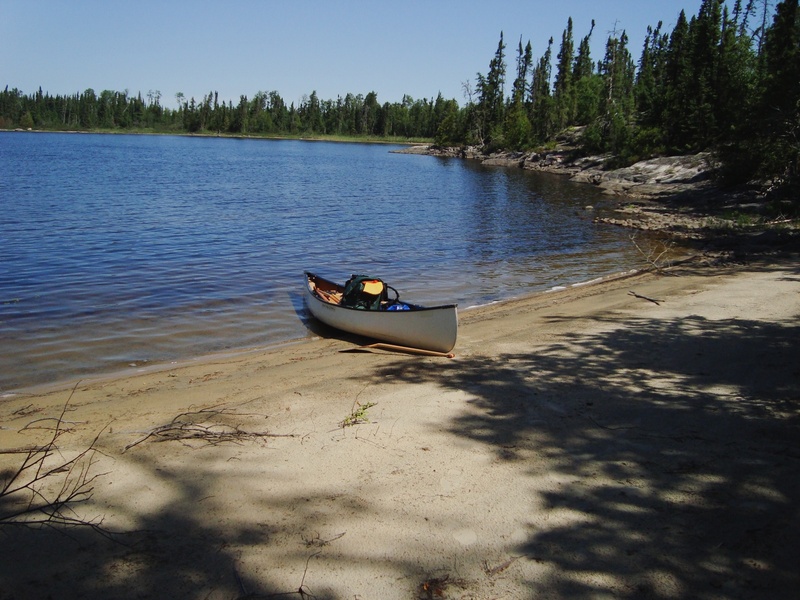 A group of us are planning a canoe trip in Wabakimi next August. We are all experienced wilderness travellers. 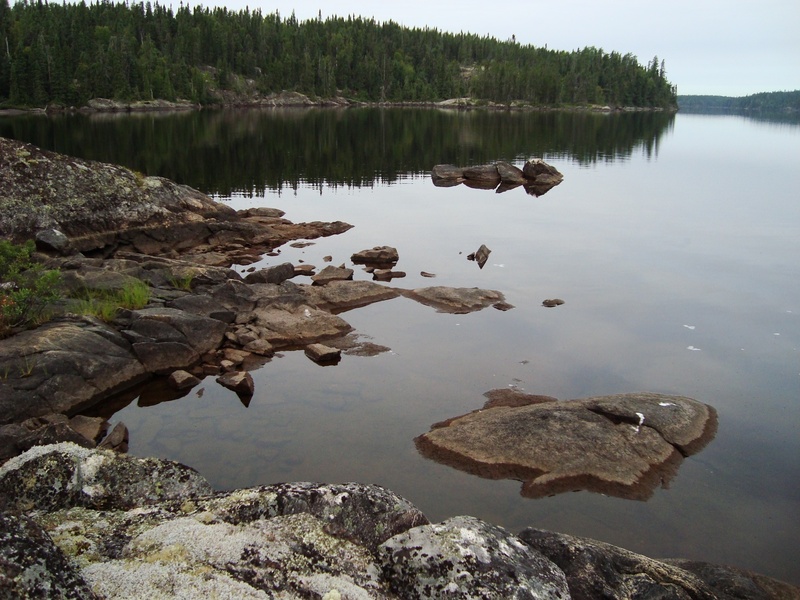 We are thinking about the Flindt River to Wabakimi Lake and then out on Caribou/Little Caribou Lake. 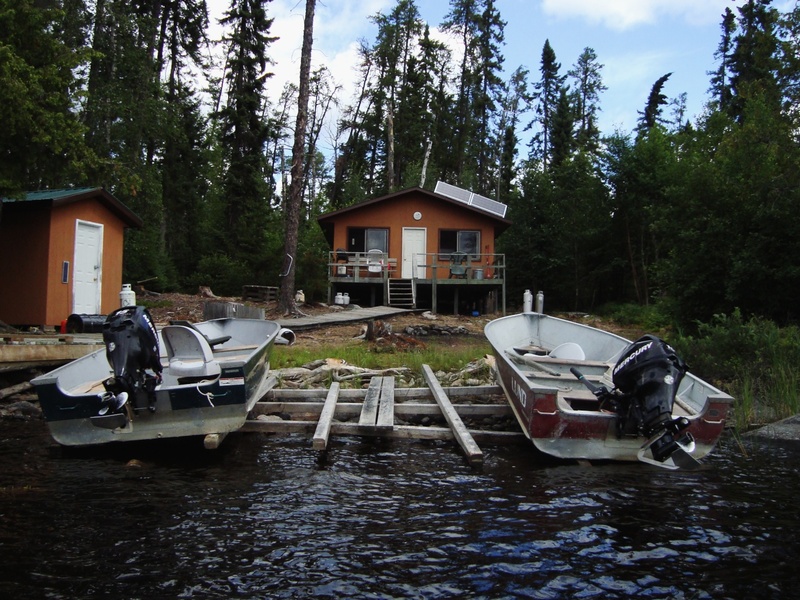 how many portages are there between Flindt River Landing and Wabakimi Lake. we want to minimize the number of portages we do. In reply to Jeff Ward in Vernon BC. Jeff, I just spent an hour going through the maps and counted 34 portages on your proposed route. 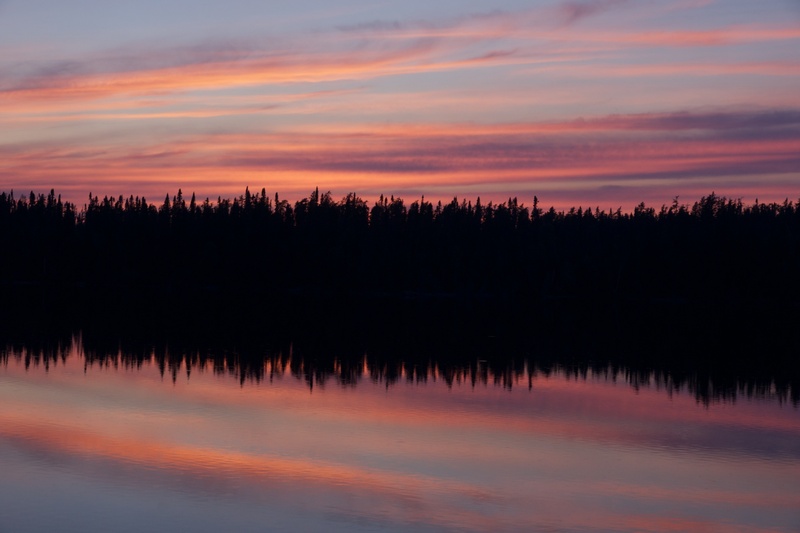 BTW – you’ve come up with a great intro to Wabakimi; you may well be back for a second helping! It costs $30. 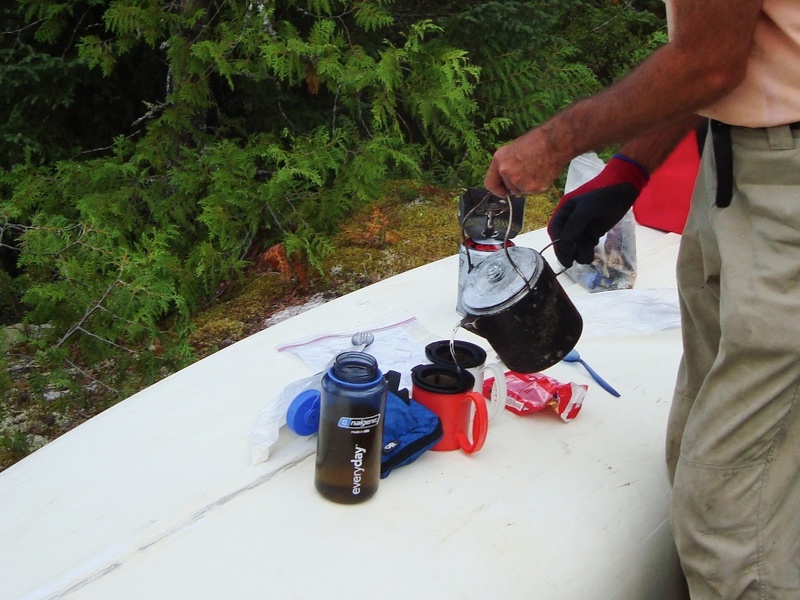 (including shipping) and helps support the volunteers who not only put the maps together but first cleared the portage trails and campsites which the maps highlight. It is both an investment in essential information and helps pay the costs to have the crews do their work. 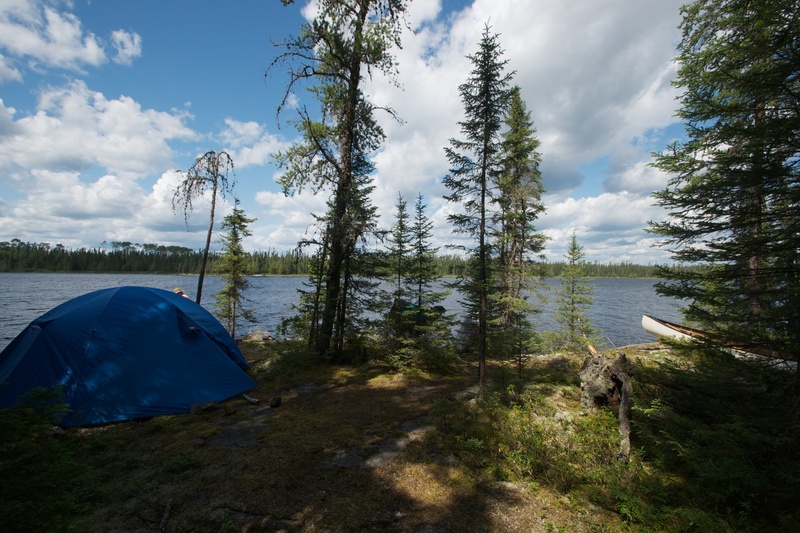 It has all the possible routes you might consider to get from Flindt Landing on the Flindt River over to the take-out on Little Caribou lake (about 6 km by road from Armstrong Station) . 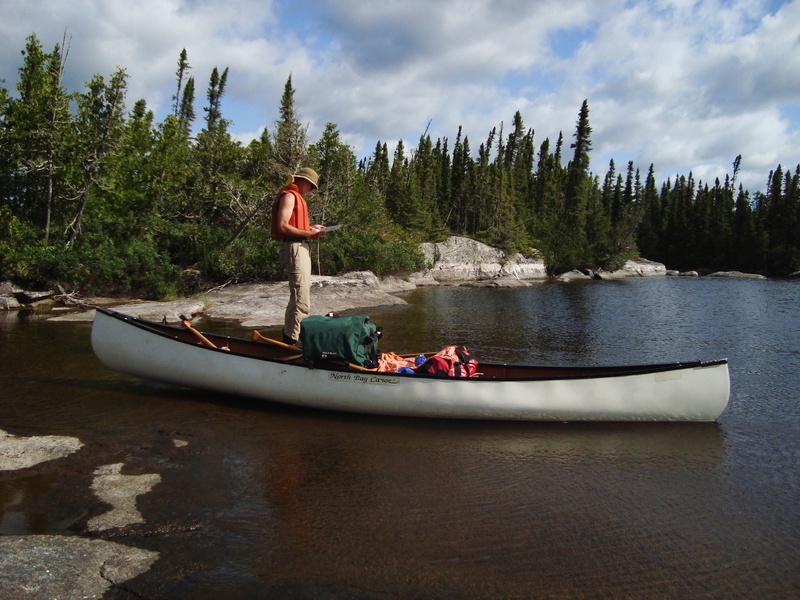 A shuttle can be arranged with Clement Quenville or with Mattice Lake Outfitters. Here are all the possible portages you may face. As I mentioned, thirty-four in all. In listing them I am somewhat shocked because on paper it sounds like way too much carrying and no fun at all! It was not that bad. Most carries are short; a number are not necessary. It varies from year to year. The key thing is being organized and making your carries as efficient as possible. Given your experience I am sure you’ve got the routine down well. North of Heafur Lake – three short portages – (25, 150, 35 m) you may be able to line on or two of them. 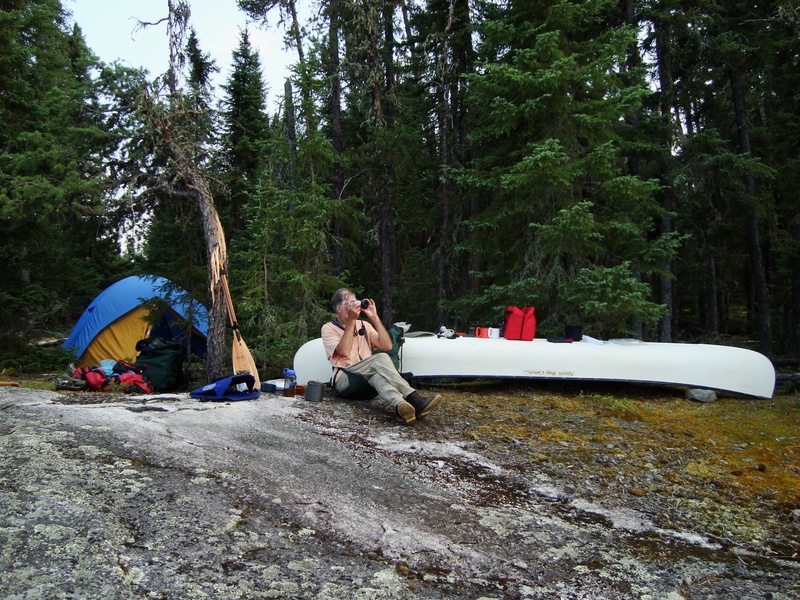 See the last couple of days of our 2010 trip down the Allan Water River and then back up to Little Caribou Lake for some specifics on the last two or three days of your route – there are also some useful links there to other trip reports including the one we found most helpful by Ken Kokanie. If you have any more specific questions feel free to email me. I may have the answer! 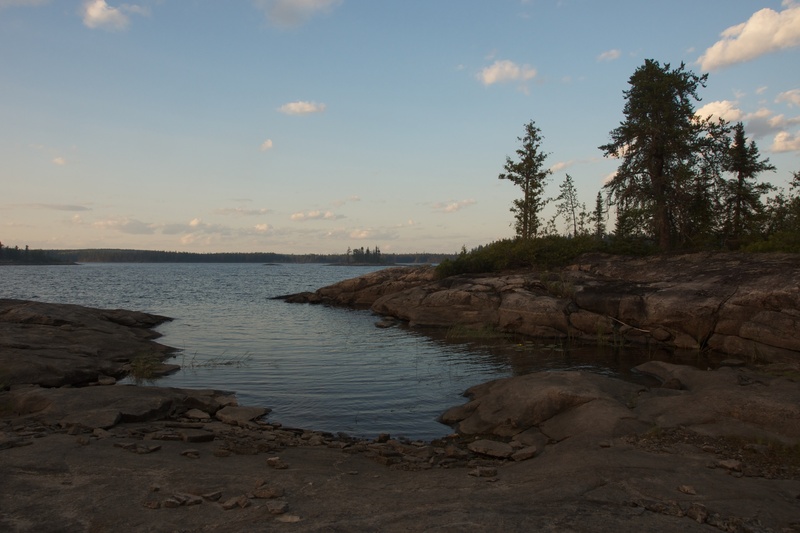 Thanks for the wonderful trip report, pictures, and insights on Wabakimi. Our first trip will be the summer of 2018. Our planned route, which of course may be adjusted, is the same as your 2010 trip. Logistically, we are catching the train in Toronto or Orillia and will travel directly to Allanwater Bridge. Not sure if we will set up a tent or book a cabin for the remainder of the night. Seems somewhat silly to get a cabin for a couple hours sleep, but the comfort of a bed may be nice after a 23 hour train ride. We are still considering the trip dates, and have tentatively planned the last week of June and first week of July. I’m a little concerned with the bugs at that time of year, and also the water levels which I presume will be high, making some rapids risky to run. My canoe partners are superb white water paddlers, and while I am confident about my ability to run CII water, that is my limit. 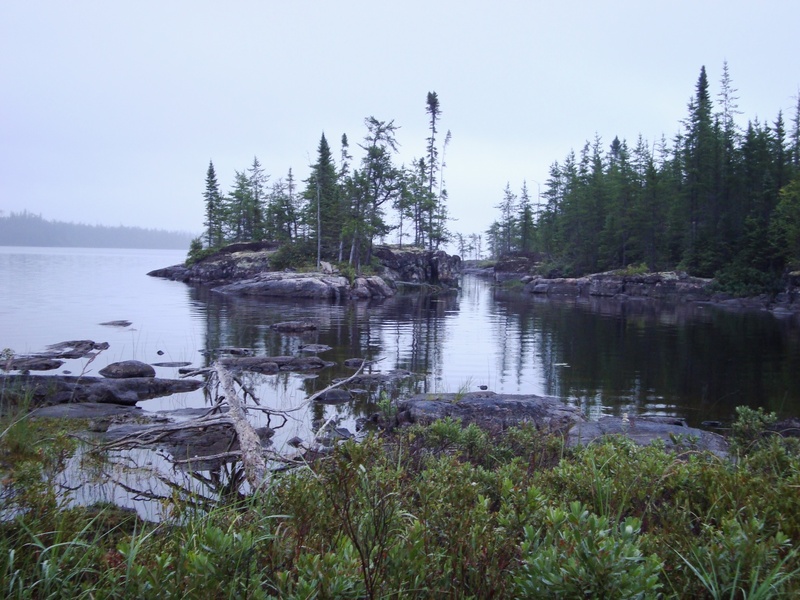 The other issue would be paddling against the flow on Caribou River and Little Caribou Lake. Am I overthinking this???? The other option is the end of August, and first week of September. Cool evenings, better bugs conditions, and presumably lower water levels makes this time of year appealing. Another decision our group will have to make is the type of canoe. I noticed you used a Kevlar for both the 2010 and 2011 trip. Were there any issues running the rapids with Kevlar, as we are considering bringing our royalex canoes. 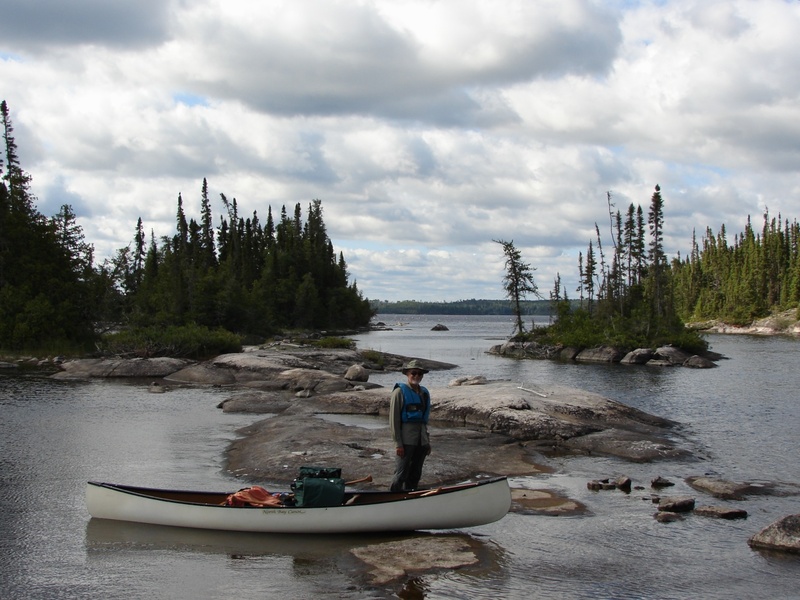 I love to fish and using my Kevlar will be much easier as I will likely do this solo from the canoe, rather than paddling the royalex. 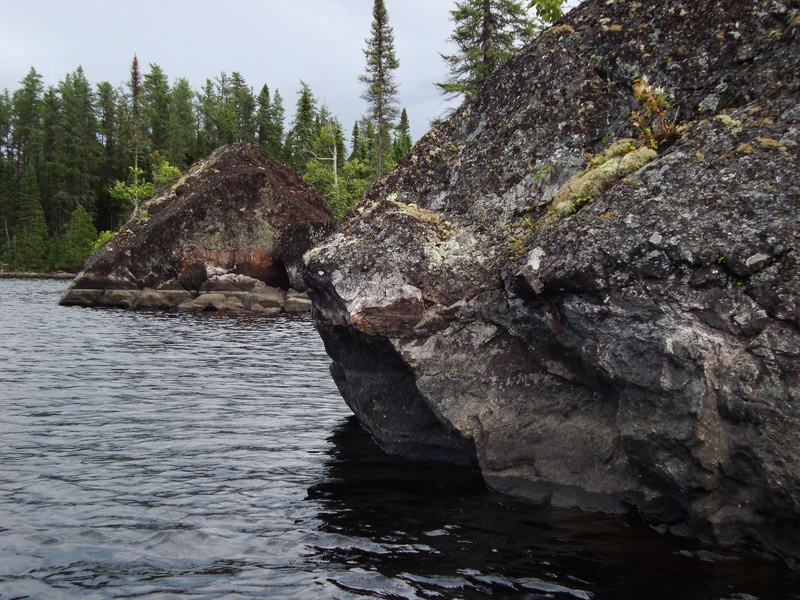 Thanks once again for the informative reports which are a great service to those of us paddling in Wabakimi for the first time. Ron – great to hear you’re off to Wabakimi! My brother and I are probably headed there again this summer after an absence of five years! 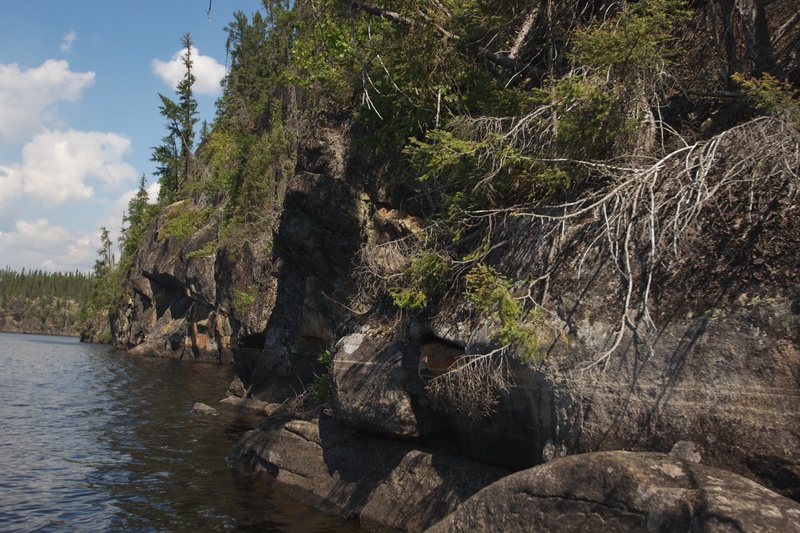 We plan to revisit Cliff Lake on the Pikitigushi River system and then paddle across the top end of Lake Nipigon to the Kopka gorge section. 1. the train option works. The train doesn’t stop at Orillia though. After leaving Union Station, it does stop at Washego and Parry Sound. The one nice thing about driving up to Armstrong Station is the flexibility it gives you for when to end the trip. We know someone in Armstrong who can arrange shuttles for you and keep your car at his place while you are doing your trip. Having a train ticket with an exact departure date boxes you in; having your vehicle waiting for you at Armstrong gives you flexibility. We have not yet decided how we are doing it this summer. My brother – the driver – is understandably keen on the train option! 2. In 2010 we were taken in by the U.S. couple who had access to the Wildwaters outpost at Allan Water Bridge. It was past midnight! We could have put up our tent between the outpost and the rail tracks on some of the ample lawn. In 2012 we returned – that time we booked a cabin at the Allan Water Lodge run by the Jelinskis. it is maybe 500 meters down the track from the Wildwaters cabin. We paid $50. for what was a 10-hour stay but it was a nice final luxury. Other paddlers on the train that night put up their tents on the other side of the tracks from the Jelinski Lodge and when I went back to see how they were doing at 8:30 a.m. they were already on their way. 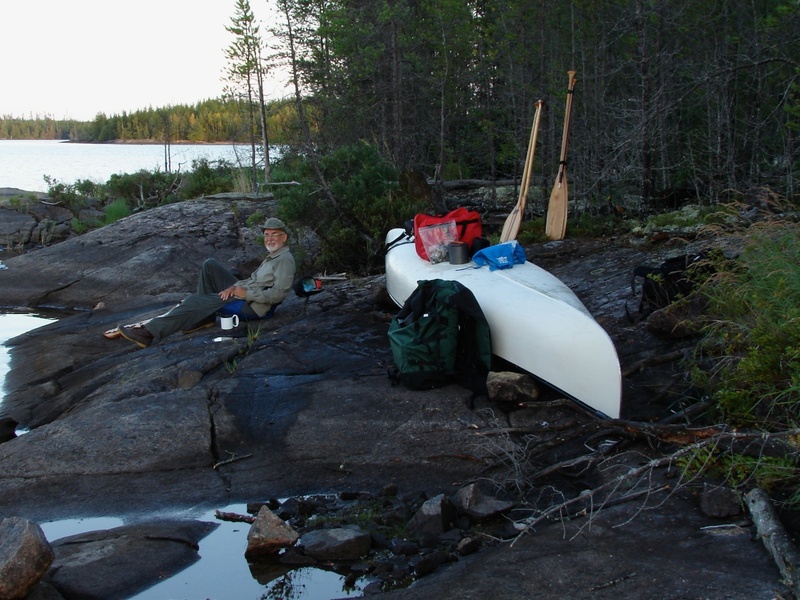 See my post on the 2012 Kopka canoe trip for more detail on the AllanWater Lodge. It sure does beat putting up your tents at 1 a.m. in the dark after a 27 hour train ride! Split among 4 people it is not a lot of money! 3. Bugs! 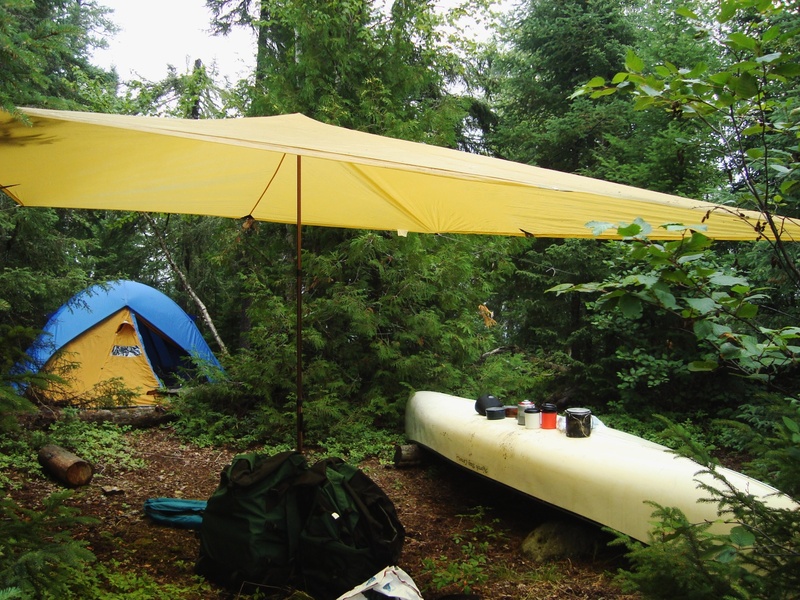 We bought our first bug tent – the Eureka NoBugZone, an excellent 9’x9’x 8’H bug shelter with an integrated tarp – for a canoe trip in the Chapleau Game Preserve last June. We were expecting the worst! It really wasn’t that bad but we did put up the Eureka a few times. For the past few years We have also taken to treating our clothing with permethrin. Two years ago the tent fly and outside of the tent itslef also got a spraying. We think the bug activity has gone way down. 4. In 2010 we had a 60 lb. fiberglass canoe. Given that we are always on our own, we err on the side of caution! We draw the line at CII. 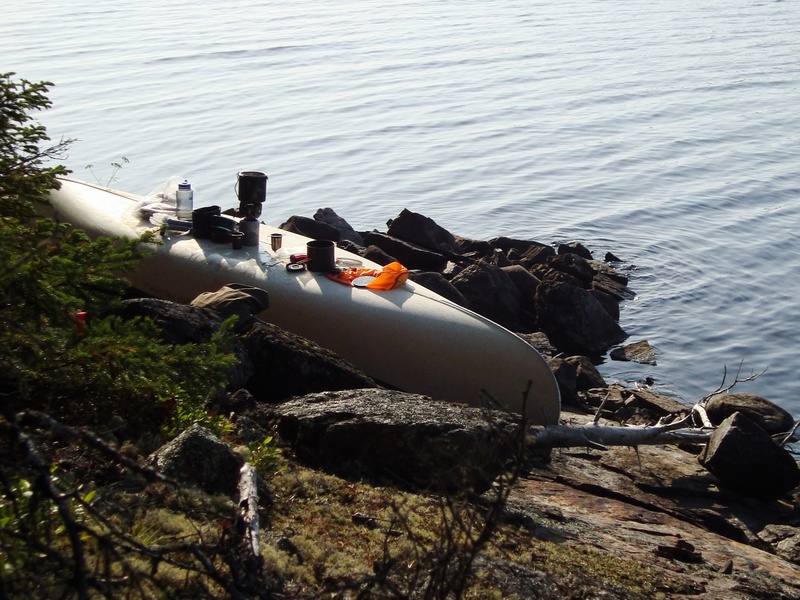 The Allanwater has a few portages, as does the Ogoki River from Outlet Bay down to Whitewater Lake. That is it as far as whitewater since the rest is lake paddle or up river travel. In that case, the only flow you will notice is as you aproach the bottom of a couple of little rapids on the Caribou River. There are some nice waterfalls at Brennan Falls and further down the AllanWater. You don’t need to be an ace river runner to do this – we certainly aren’t! You will do just fine. 5. Late August- early September is when we did our first visit to Wabakimi. We also like that time of the season for the reasons you stated. We were, however, pleasantly surprised by how nice it was to paddle in June last summer though we did get rained on for five days out of ten! 6. Canoes. Bring your royalex canoes. There are no really long portages to worry about and the royalex will allow you to bump and ooze your way down some rocky rapids without worry. Having a kevlar/carbon fiber does get you to baby the canoe much more and to line and run parts of the river you might just bomb down in your royaliex. Either will get the job done, just differently! You picked a nice introductory trip into Wabakimi; it will be the first of a few you make up there! Two weeks is a reasonable amount of time to spend though we in typical Albinger Bros fashion did it a bit faster. 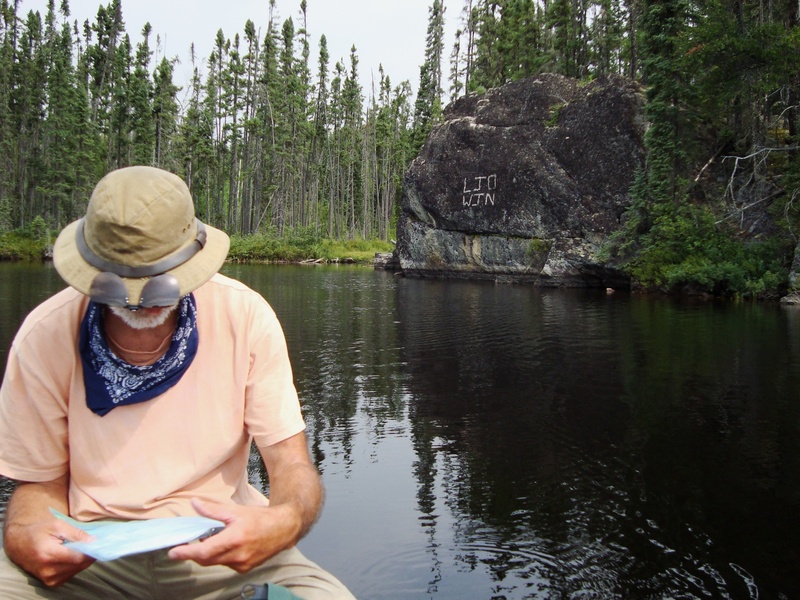 With the Kokanie map set, the Friends of Wabakimi maps, and Laurent Mills’ maps you will have more than enough info on the portages and rapids and camp sites to plan your days. If you have any more questions, just send them this way! I am looking forward to a three-week April trek in Nepal’s upper Mustang region near the border with Tibet. I just spent a mind-numbing one hour on the Stair Master at the gym this aft. Much more of the same to come! I’ll be in great shape for this summer’s canoe trip!